Bile is an important component of the human gastrointestinal tract with an essential role in food absorption and antimicrobial activities. Enteric bacterial pathogens have developed strategies to sense bile as an environmental cue to regulate virulence genes during infection. We discovered that Vibrio parahaemolyticus VtrC, along with VtrA and VtrB, are required for activating the virulence type III secretion system 2 in response to bile salts. 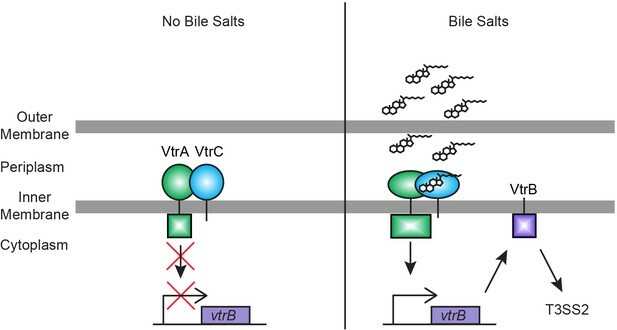 The VtrA/VtrC complex activates VtrB in the presence of bile salts. The crystal structure of the periplasmic domains of the VtrA/VtrC heterodimer reveals a β-barrel with a hydrophobic inner chamber. A co-crystal structure of VtrA/VtrC with bile salt, along with biophysical and mutational analysis, demonstrates that the hydrophobic chamber binds bile salts and activates the virulence network. As part of a family of conserved signaling receptors, VtrA/VtrC provides structural and functional insights into the evolutionarily conserved mechanism used by bacteria to sense their environment. When we eat a meal, bile salts in the intestine help the body to absorb molecules of fat. Certain bacteria that cause food poisoning in humans, such as Vibrio parahaemolyticus, can also detect bile salts and use them to sense that they have reached the intestine of a suitable host. The bacteria then produce toxins that inflame the intestine; this can result in days of diarrhea. However, it was not clear how the bacteria detect the bile salt signal and how this triggers them to produce the toxins. Li, Rivera-Cancel et al. now discover that not one, but two, genes are required for this process. The genes encode two proteins, called VtrA and VtrC, that interact to form protein ‘complex’ on the surface of the membrane that surrounds the bacterial cell. The two proteins create a barrel-like structure that can bind to bile salts and trigger the cell to produce the toxins. Future experiments will aim to understand how the binding of bile salts to this protein complex causes an increase toxin production. A future challenge is to find out how other disease-causing bacteria sense environmental cues to produce toxins. 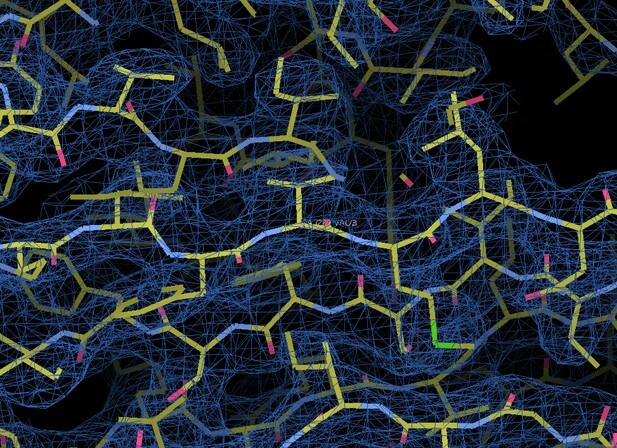 With this knowledge, researchers might be able to design new drugs that could prevent the production of toxins to relieve symptoms of food poisoning and other illnesses. Bile is an important component of the human gastrointestinal tract that plays a major role in the emulsification and solubilization of lipids (Begley et al., 2005). Its main components are bile salts, cholesterol, and phospholipids that together possess antimicrobial activities, challenging the survival and colonization of both pathogenic and commensal bacteria (Begley et al., 2005). There is increasing evidence that enteric bacterial pathogens can utilize bile as a signaling cue to regulate gene expression profiles during host infection. For example, Salmonella typhimurium senses bile to repress the genes involved in invasion when growing in the intestinal lumen and induce their expression to promote invasion upon the penetration of the mucosal layer wherein the concentration of bile is decreased (Prouty and Gunn, 2000; Prouty et al., 2004). In Shigella spp., bile salts increase the pathogen's adherence and invasion of epithelial cells (Pope et al., 1995). Bile also has important effects on the pathogenicity of Vibrio species, as observed in multiple studies with pathogenic strains of V. cholerae and V. parahaemolyticus (Gupta and Chowdhury, 1997; Schuhmacher and Klose, 1999; Krukonis and DiRita, 2003; Faruque et al., 1998). V. cholerae produces two major virulence factors during infection, cholera toxin (CT) and toxin-coregulated pilus (TCP), and these factors are repressed by ToxT in the presence of bile (Gupta and Chowdhury, 1997; Schuhmacher and Klose, 1999; Krukonis and DiRita, 2003; Faruque et al., 1998). However, it was also reported that bile can activate the production of CT independent of ToxT (Hung and Mekalanos, 2005). Non-O1/non-O139 V. cholerae strains that do not encode CT and TCP can cause gastroenteritis and utilize bile to activate a pathogenic type III secretion system (Dziejman et al., 2005; Chaand et al., 2015; Alam et al., 2010). Similarly, V. parahaemolyticus type III secretion system 2 (T3SS2) is induced specifically by bile salts during infection, resulting in acute gastroenteritis (Gotoh et al., 2010). Despite these important discoveries, the mechanism of sensing bile salts by pathogenic bacteria remains unknown. To investigate this mystery, we used V. parahaemolyticus as a model to elucidate how Vibrio spp. sense bile salts as a signal to regulate the expression of virulence genes. V. parahaemolyticus is a globally-spread, Gram-negative, halophilic bacterial pathogen that inhabits marine and estuarine environments and is the world’s leading cause of acute gastroenteritis due to the consumption of raw or undercooked seafood (Broberg et al., 2011; Zhang and Orth, 2013). During recent years, rising temperatures in the ocean has contributed to this pathogen’s worldwide dissemination (Nair et al., 2007; Velazquez-Roman et al., 2013; McLaughlin et al., 2005; O'Boyle and Boyd, 2014; Daniels et al., 2000). V. parahaemolyticus is also the causative agent of the devastating shrimp disease Acute Hepatopancreatic Necrosis Disease (AHPND) (Tran et al., 2013; Lee et al., 2015). Over the last decade, enormous progress has been made to elucidate virulence factors used by this pathogen and tools are available to study virulence mechanisms at the genetic and biochemical levels (de Souza Santos et al., 2015). As part of its virulence repertoire, V. parahaemolyticus encodes two T3SSs: the cytotoxic T3SS1 and the enterotoxic T3SS2. T3SSs encode needle-like secretion apparatuses used to deliver bacterial effector proteins, called Vops, which allow V. parahaemolyticus to invade and kill infected host cells (Broberg et al., 2011; Makino et al., 2003; Galán and Wolf-Watz, 2006). Each T3SS delivers a specific set of Vops into a host cell (Broberg et al., 2011). For example, the T3SS1 exclusively secretes VopQ, VopR, VPA0450 and VopS and uses the effectors to orchestrate a multifaceted host cell death. This system is found in all strains of V. parahaemolyticus, and therefore is proposed to be important for bacterial survival in the environment (Broberg et al., 2011). T3SS2 is present in clinical isolates of V. parahaemolyticus and is a key bile salt-induced virulence system that causes enterotoxicity and symptoms associated with gastroenteritis during infection (Broberg et al., 2011; Park et al., 2004; Hiyoshi et al., 2010; Ritchie et al., 2012). Bile salts not only induce Vops, such as VopA and VopC, but also the needle-like secretion apparatus, including components such as T3SS2 translocon VopD2 (Broberg et al., 2011; Zhang and Orth, 2013; Trosky et al., 2004). In V. parahaemolyticus, the activation of T3SS2 by bile salts is regulated by two transmembrane ToxR-like transcription factors, VtrA (VPA1332) and VtrB (VPA1348) (Gotoh et al., 2010; Kodama et al., 2010). Homologues of VtrA and VtrB, named VttRA and VttRB respectively, have been identified in T3SS-containing non-O1/non-O139 V. cholerae strains and function in a similar way (Alam et al., 2010). Despite the identification of these transcription factors, the molecular mechanism underlying bile salts sensing and T3SS2 signal propagation by V. parahaemolyticus and V. cholerae is unknown. Here, we identify VtrC (VPA1333) from V. parahaemolyticus as a previously unrecognized component necessary for bile salt sensing and T3SS2 activation. vtrC is constitutively co-transcribed with vtrA as an overlapping 3’ open reading frame. Furthermore, we demonstrate that the periplasmic domains of the transmembrane proteins, VtrA and VtrC, form a functional complex that binds bile salts to activate VtrA’s cytoplasmic DNA binding domain, which in turn induces T3SS2 via the downstream transcription factor VtrB. The structure of VtrA/VtrC periplasmic domains reveals an obligate heterodimer where VtrC recruits structural elements from VtrA to complete a β-barrel with a hydrophobic inner chamber that binds bile salts. A co-crystal structure of the VtrA/VtrC heterodimer with a bile salt reveals that ligand binding occurs in the hydrophobic inner chamber of VtrC, similar to that found for the family of monomeric calycins. Mutations of residues within the hydrophobic chamber that are important for bile salt-binding disrupt bile salt activation of T3SS2. Collectively, we uncover a mechanism by which bacteria can sense bile salts, and reveal how an evolutionarily conserved receptor senses an environmental cue to induce the production of virulence factors. vtrC (vpa1333) is a previously uncharacterized gene in V. parahaemolyticus that is located directly downstream of vtrA (Figure 1A). The open reading frames for vtrA and vtrC overlap by 17 nucleotides, suggesting that they are likely in the same operon and function in the same biological process. We observed that the gene organization of vtrA, vtrC and vtrB in the genome is highly conserved in other Vibrio and related species (Figure 1A). Both V. cholerae non-O1/O139 strains and Grimontia hollisae possess a T3SS similar to T3SS2 in V. parahaemolyticus and cause gastroenteritis during human infection (Dziejman et al., 2005). RT-PCR of the region spanning vtrA and vtrC showed that these genes are indeed in the same operon and co-transcribed before and after bile salt-mediated T3SS2 induction (Figure 1B, lanes 3, 5). PSI-BLAST analysis with the predicted VtrC protein sequence revealed that it is conserved in various Vibrio and related species, as well as in Moritella. VtrC has a highly conserved N-terminal transmembrane signal anchor that is predicted to direct and retain proteins in the bacterial membrane (Figure 1C). PSI-BLAST analysis using VtrA's sequence without the cytoplasmic DNA binding domain identified homologues in the same group of bacteria where VtrC is found (Figure 1—figure supplement 1). Furthermore, ten other strains of bacteria contain homologous genes of vtrA and vtrC but not vtrB (Figure 1—figure supplement 2). These results support the hypothesis that VtrA and VtrC evolved independently of VtrB. VtrC is conserved in various Vibrio and other species with VtrA-like sequences. (A) The gene organization of vtrA, vtrC, and vtrB is conserved in the T3SS2-like pathogenicity island of Vibrionaceae family species, with variable numbers of inserted genes (indicated by numbers in parentheses) between vtrC (or its homologous gene) and vtrB (or its homologous gene). (B) RT-PCR to amplify the target region shown by the bar that spans vtrA and vtrC. - Bile, Vibrio parahaemolyticus POR1 strain growing in LB without bile salts; + Bile, POR1 growing in LB supplemented with 0.05% bile salts. - RT, without reverse transcriptase; + RT, with reverse transcriptase; lane 1: DNA marker. RT-PCR is representative of three independent experiments. (C) Multiple protein sequence alignment of VtrC and its homologues. GI number of each protein is listed before the species names. Residues are highlighted according to group-wise conservations: mainly hydrophobic (yellow) and small (gray). Signal anchor: the predicted N-terminal transmembrane domain. An empty line is inserted between the species that contain (top) or lack (bottom) vtrB (or vtrB homologous gene). *marks protein sequences that were translated from nucleotide to include the entire N-terminus. VtrA and VtrB are involved in the activation of the T3SS by bile salts. Therefore, we set out to determine whether VtrC also plays a role in this pathway. Because vtrA and vtrC overlap by 17 nucleotides, we generated a deletion of vtrC from the V. parahaemolyticus POR1 strain by retaining vtrC’s first 33 nucleotides thereby leaving the vtrA open reading frame intact (see Materials and methods). Deletion of vtrC completely abolished the activation of T3SS2 by bile salts, as shown by the loss of expression and secretion of the T3SS2 effectors VopA and VopC, and of the T3SS2 translocon VopD2 (Figure 2A,B). Complementation of vtrC deletion by a vector expressing VtrC fully restored the activity of T3SS2 (Figure 2A,B), indicating that the phenotypes observed in the vtrC deletion were not caused by a polar effect on neighboring genes. The effect of VtrC is specific to T3SS2 because its deletion had no impact on the expression and secretion of the T3SS1 effector VopS (Figure 2C). Taken together, these results indicate that VtrC is required for T3SS2 activation by bile salts. VtrC is essential for the activity of V. parahaemolyticus T3SS2 in the presence of bile salts. Expression (Cell) and secretion (Sup) of V. parahaemolyticus T3SS components were analyzed by Western blot. Loading control (LC) is shown for total protein lysate. 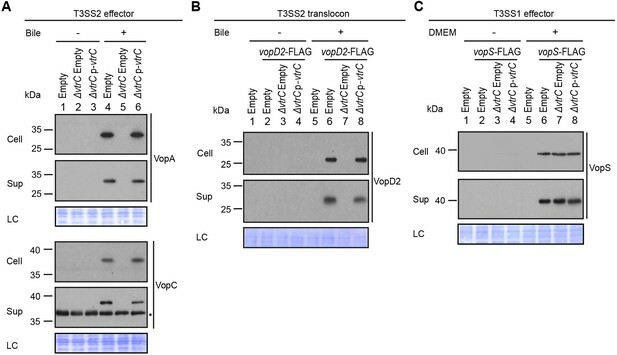 (A–B) Expression and secretion of T3SS2 effectors VopA and VopC, and translocon VopD2 by V. parahaemolyticus POR1 derivative strains with the empty pBAD vector (Empty), vtrC deletion (ΔvtrC Empty) or vtrC complementation (ΔvtrC p-vtrC) containing a pBAD vector expressing VtrC under the putative promoter of its operon (1kb upstream of vtrA). Protein-specific antibodies were used to detect VopA and VopC. Anti-FLAG antibody was used to detect C-terminal endogenously FLAG-tagged VopD2. -/+ Bile, V. parahaemolyticus grown in LB without bile salts (-) or supplemented with 0.05% bile salts (+). Non-specific band is indicated with an asterisk. (C) Expression and secretion of T3SS1 effector VopS by V. parahaemolyticus POR1 derivative strains with the empty pBAD vector (Empty), vtrC deletion (ΔvtrC Empty) or vtrC complementation (ΔvtrC p-vtrC). 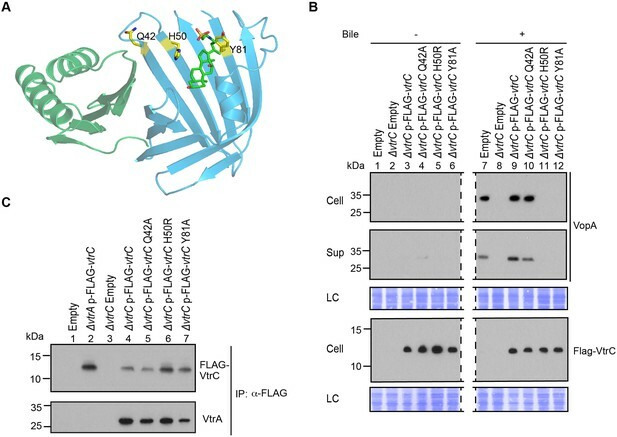 Anti-FLAG antibody was used to detect endogenously C-terminal FLAG-tagged VopS. -/+ DMEM, V. parahaemolyticus grown in LB (-) or DMEM (+). Data is representative of three independent experiments. Analysis of the VtrC protein sequence using membrane topology prediction programs, TMpred, TMHMM 2.0, HMMtop 2.0, and Phobius indicates VtrC is an inner membrane protein with the N-terminal 1–9 amino acids facing the cytoplasm, a single transmembrane helix (10–24 amino acids) and the C-terminal domain (25–161 amino acids) in the periplasm (Figure 3A). To verify the cellular localization and orientation of VtrC, we used two reporter proteins from Escherichia coli, alkaline phosphatase PhoA and β-galactosidase LacZ, whose activities depend on their subcellular localization. PhoA is active only in the periplasm after disulfide bond formation and dimerization, whereas LacZ only exhibits enzymatic activity in the cytoplasm where it can fold properly (van Geest and Lolkema, 2000). PhoA or LacZ were fused to either the N-terminus or the C-terminus of VtrC and their activities were then measured to determine the localization of VtrC (Liu, 2003). As expected, PhoA was active when fused to the C-terminus of VtrC, but not N-terminus (Figure 3B). In addition, LacZ was more active when fused to the N-terminus of VtrC (Figure 3C). These observations demonstrate that VtrC is localized to the inner membrane with the N-terminal 9 amino acids in the cytoplasm and the C-terminal domain in the periplasm. VtrC is an inner membrane protein with the N-terminus in the cytoplasm and the C-terminus in the periplasm. (A) Predicted cellular localization and orientation of VtrC. Active form of PhoA or LacZ fused to VtrC based on prediction. (B) Alkaline phosphatase PhoA activity of POR1 with the empty pBAD vector (Empty), expressing N terminal PhoA-VtrC (p-phoA-vtrC) or C terminal VtrC-PhoA (p-vtrC-phoA) fusion protein. 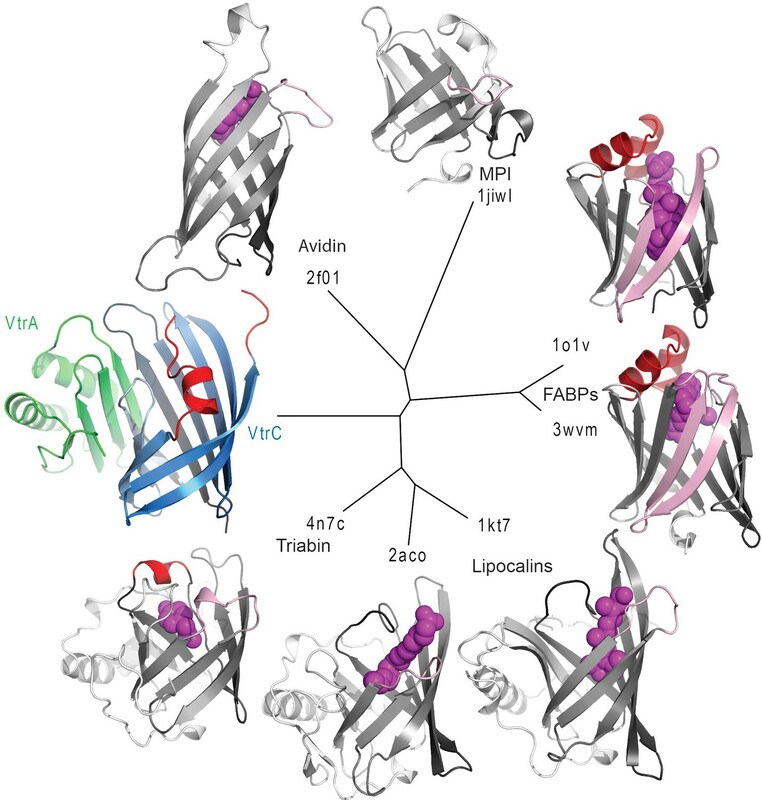 (C) β-galactosidase LacZ activity of POR1 with the empty pBAD vector (Empty), expressing N terminal LacZ-VtrC (p-lacZ-vtrC) or C terminal VtrC-LacZ (p-vtrC-lacZ) fusion protein. ****p<0.0001, n = 3, +/- S.E.M. Data is representative of three independent experiments. Previous studies have shown that VtrA directly controls the expression of VtrB and that both proteins are inner membrane proteins with their N-terminal DNA binding domain oriented in the cytoplasm and their C-terminal region in the periplasm (Figure 4A) (Kodama et al., 2010). Given that VtrC is constitutively expressed and its C-terminal domain is oriented in the periplasm, we hypothesized that VtrC, like VtrA, functions upstream of VtrB. The deletion of vtrC did not change the mRNA level of VtrA (Figure 4B). Interestingly, deletion of vtrC resulted in decreased protein levels of VtrA independent of bile salts (Figure 4C, lanes 3 and 7), suggesting that the presence of VtrC might stabilize VtrA. Ectopic expression of VtrC from a plasmid rescued VtrA levels (Figure 4C, lanes 4 and 8). As was previously observed for VtrA, the absence of VtrC prevented the induction of vtrB upon T3SS2 activation with bile salts (Figure 4D). Thus, VtrC appears to function upstream of VtrB via a signaling cascade including VtrA. The observed degradation of VtrA in the absence of VtrC suggested that there might be a direct physical interaction between VtrA and VtrC. VtrC is necessary for maintaining VtrA protein level and the induction of VtrB. The effects of VtrC on VtrA and VtrB were characterized using V. parahaemolyticus POR1 derivative strains with the empty pBAD vector (Empty), vtrA deletion (ΔvtrA Empty), vtrC deletion (ΔvtrC Empty) or vtrC complementation (ΔvtrC p-vtrC) containing a pBAD vector expressing VtrC under the putative promoter of its operon (1kb upstream of vtrA). (A) Cellular localization and orientation of VtrA, VtrB and VtrC. (B) qRT-PCR analysis of VtrA mRNA level relative to POR1 with the empty pBAD vector (Empty) grown in LB without bile salts. (C) Western blot analysis of VtrA protein level. Protein specific antibody was used to detect VtrA. Non-specific band is indicated with an asterisk. (D) qRT-PCR analysis of VtrB mRNA level relative to POR1 with the empty pBAD vector (Empty) grown in LB without bile salts. -/+ Bile, V. parahaemolyticus grown in LB without bile salts (-) or supplemented with 0.05% bile salts (+). For qRT-PCR analysis, expression of vtrA and vtrB was normalized to the expression of the control gene fliA. Data is representative of three independent experiments. To test whether VtrA and VtrC form a complex in vivo, we performed co-immunoprecipitation using endogenous VtrA and ectopically expressed N-terminal FLAG-tagged VtrC. 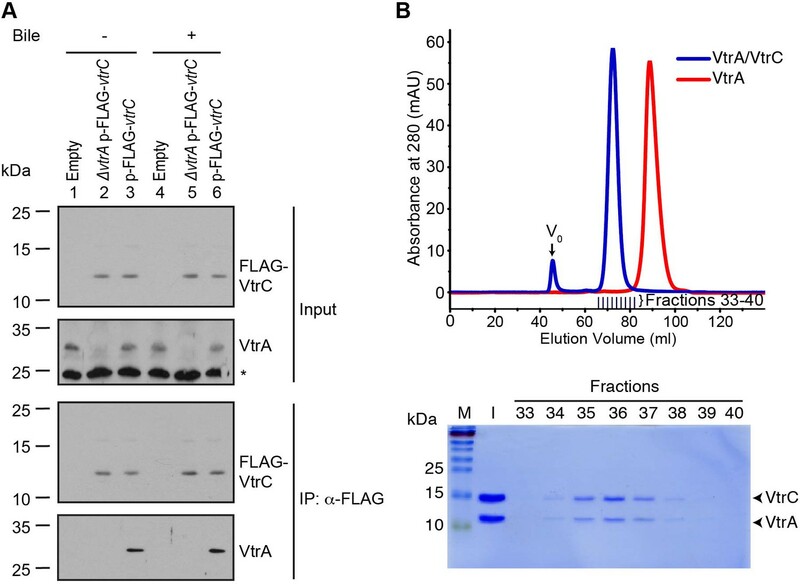 Analysis of FLAG immunoprecipitates revealed that endogenous VtrA co-precipitated with VtrC, indicating that these two proteins interact in vivo (Figure 5A, lanes 3 and 6). VtrA and VtrC interact in the presence and absence of bile salts, suggesting that these proteins interact independently of bile salts before activation of T3SS2 by bile salts, and remain in a complex after treatment with bile salts (Figure 5A). Notably, ectopic expression of FLAG-VtrC, but not FLAG-VtrC that is deleted for its N-terminal transmembrane domain (FLAG-VtrCΔN30), fully complemented the deletion of vtrC and restored the activity of T3SS2, confirming that the wild type FLAG-tagged is functional (Figure 5—figure supplement 1). However, we noticed that the apparent molecular weight of full-length FLAG-VtrC (12 kDa) is smaller than the expected size of this protein (20 kDa) suggesting that VtrC may be processed in the periplasm. In any event, our results support that VtrC and VtrA interact in vivo. VtrA and VtrC form a complex. (A) Co-immunoprecipitation (Co-IP) of endogenous VtrA and vector induced FLAG-VtrC. pBAD vector induced N-terminal FLAG-tagged VtrC was immunoprecipitated with anti-FLAG affinity gel from V. parahaemolyticus POR1 derivative strains that express only VtrA (Empty), only N-terminal FLAG-tagged VtrC (ΔvtrA p-FLAG-vtrC), or both (p-FLAG-vtrC). Protein-specific antibody was used to detect VtrA. Anti-FLAG antibody was used to detect FLAG-VtrC. -/+ Bile, V. parahaemolyticus grown in LB without bile salts (-) or supplemented with 0.05% bile salts (+). Non-specific band is indicated with an asterisk. Data is representative of three independent experiments. (B) Top, gel filtration analysis of the VtrA/VtrC periplasmic domain complex, void volume of the column is indicated as V0. Bottom, SDS-PAGE analysis of samples from the fractions corresponding to the elution peak of the complex. Based on the orientation of VtrA and VtrC, we hypothesized these proteins would interact through their periplasmic domains. We found that the VtrA periplasmic domain (aa 161–253) is soluble when expressed in E. coli; however, attempts to express and purify the periplasmic domain of VtrC were unsuccessful. We predicted that the VtrA/VtrC interaction might stabilize the VtrC periplasmic domain. Therefore, we co-expressed the periplasmic domains of these two proteins in E. coli: amino acids 161–253 of VtrA and N-terminal His-tagged 31–161 of VtrC. Both proteins co-purified by Ni-NTA-affinity chromatography and remained as a stable and soluble complex during size exclusion chromatography (SEC). The VtrA/VtrC complex eluted as a 29.5 kDa species by SEC, indicating a 1:1 heterodimer of VtrA (11.0 kDa) and VtrC (16.9 kDa) periplasmic domains (Figure 5B). VtrA alone appeared to elute as a monomer of approximately 11 kDa (Figure 5B). To further understand the nature of the interaction between the periplasmic domains of VtrA and VtrC, we crystallized the complex and obtained its X-ray structure. The structure was solved by multiple-wavelength anomalous dispersion phasing using anomalous signals from selenomethionine and refined to a resolution of 2.70 Å using native data from an isomorphous crystal. Two of the five selenomethionines were used for phasing. The two N-terminal methionines and Se-Met 115 in the loop that covers the beta barrel of VtrC were not observed in the final electron density map and were not included in the final model. The asymmetric unit contains one complex with one copy each of the VtrC and VtrA periplasmic domains (Figure 6A). The VtrA and VtrC subunits in the heterodimer make extensive interactions with each other (Figure 6B), with an interface area of 1,149 Å2 (Krissinel and Henrick, 2007). An analysis of the macromolecular interfaces in this crystalline lattice by the web server PDBePISA (http://www.ebi.ac.uk/pdbe/pisa/pistart.html) (Krissinel and Henrick, 2007) indicate that the VtrA/VtrC heterodimer is the only stable quaternary structure in solution. Structure of the VtrA/VtrC heterodimer. (A) Cartoon representation of the periplasmic domain complex formed by VtrA (green) and VtrC (blue, light to dark gradient from N-terminus to C-terminus). Side chains of Hβ-Iβ loop residues are shown as sticks. (B) Detailed view of the VtrA/VtrC interface. Selected residues that form polar contacts (black dashed lines), as well as potential bile salt binding residues are shown as sticks. (C) Overlay of surface and ribbon models of VtrC showing interior cavity. Side chains of residues lining the cavity are shown as sticks in yellow for hydrophobic residues (Ala, Val, Ile, Leu, Met, Phe, Tyr, Trp) and green for all other. The VtrC subunit consists of eight β-strands and a short α-helix. The eight β-strands of VtrC form a β-sheet meander that folds into itself to form a β-barrel with a small space between the first and last β-strands (Aβ and Iβ) (Video 1). The β-barrel is lined on the inside by hydrophobic side chains (Figure 6C) and is covered on one side by the short α-helix (Fα) and an adjacent disordered loop, which could not be modeled in its entirety due to the poor electron density of this region (Figure 6A). The Hβ-Iβ loop is particularly rich in aromatic side-chains, promoting us to hypothesize that this loop could be involved in binding the steroid ring structure of bile acids (Figure 6A,B). Despite the lack of sequence similarity to proteins of known function, VtrC shares structural similarity with lipocalins, fatty acid binding proteins (FABPs), avidins, metalloprotease inhibitors (MPIs), and other members of the calycin superfamily of proteins (Figure 7) (Flower et al., 2000). The inside of the calycin β-barrel often acts as a binding site for fatty acids and other hydrophobic molecules, such as retinol and biotin (Flower et al., 2000). Comparison of the overall VtrC structure with other calycins suggests that it adopts a new fold within the superfamily. VtrC falls in between the lipocalins, which include a C-terminal helix that packs against the barrel on the corresponding VtrA interacting surface; and the FABPs, which include a β-hairpin insertion into the typical 8-stranded β-barrel in the position of the VtrC disordered loop. Interestingly, VtrA/VtrC would be the first member of this family that is an obligate dimer and not only binds a hydrophobic ligand but also transmits a signal upon binding. Rotation of VtrA/VtrC heterodimer demonstrates the binding cavity of the beta-barrel. Further rotation shows how VtrA contributes a strand to the ‘open’ beta barrel formed by VtrC. Extensive hydrogen bonding is observed between VtrA and VtrC. Structure based distance tree of VtrA/VtrC heterodimer and members of the calycin superfamily. Structures representatives of calycin superfamilies: MPI, avidin, FABPs, lipocalins, and triabin with bound ligands in the centers of the barrels (magenta spheres) were chosen. The conserved 8-stranded barrel core found in all structures is colored from dark to light grey for all representatives and dark to light blue for VtrC. The Hβ-Iβ loop containing the presumed VtrC helical lid (red) is unique to the subunit, as compared to the corresponding loops from representative structures (light pink). This loop also corresponds to the position of the inserted FABP β-hairpin (light pink). The functionally analogous helical lid in FABPs (red) is located after the first β-strand of the barrel. The triabin structure closes the binding pocket with hydrophobic residues from both the FABP lid loop (red) and the VtrC loop (pink). The VtrA subunit adopts an alpha/beta fold with a five-stranded β-sheet and two α-helices on one side of the sheet (Figure 6A). The bulk of the contacts with VtrC is through VtrA's five-stranded β-sheet on the side opposite to the α-helices and involves both hydrophobic and polar contacts. VtrA Fβ intercalates between VtrC Aβ and Iβ, making numerous polar contacts with VtrC Aβ and closing the gap in the VtrC β-barrel (Figure 6B). The incorporation of structural elements from VtrA into the β-barrel fold suggests that VtrC may not fold properly in isolation and is consistent with our inability to purify the VtrC periplasmic domain in the absence of VtrA. Interestingly, the N-terminus of the VtrA periplasmic domain, leading to the transmembrane helix, contacts VtrC Gβ and is in close proximity to the aromatic-rich Hβ-Iβ loop (Figure 6B), leading us to hypothesize that these residues might be involved in signal transmission across the membrane in response to ligand binding. Based on the structural similarities between the monomeric calycins and the VtrA/VtrC heterodimer, we predicted that VtrA/VtrC complex could bind bile salts. Previously, Gotoh et al. (Gotoh et al., 2010) established that bile salts are the component of bile that activates the T3SS2. We have recapitulated this data and confirmed which purified bile salts could activate T3SS2. We validated that taurodeoxycholate (TDC) and glycodeoxycholate (GDC), but not chenodeoxycholate (CDC) or cholate (CA), could activate the V. parahaemolyticus T3SS2 (Figure 6—figure supplement 1). Based on this information we moved forward with biophysical experiments to test whether the VtrA/VtrC heterodimer is the bile salt receptor using a relevant bile salt, TDC. We first tested whether the VtrA/VtrC periplasmic domain heterodimer could bind bile salts using isothermal titration calorimetry (ITC). Negative power deflections were observed throughout the titration of the bile salt TDC into the VtrA/VtrC solution. 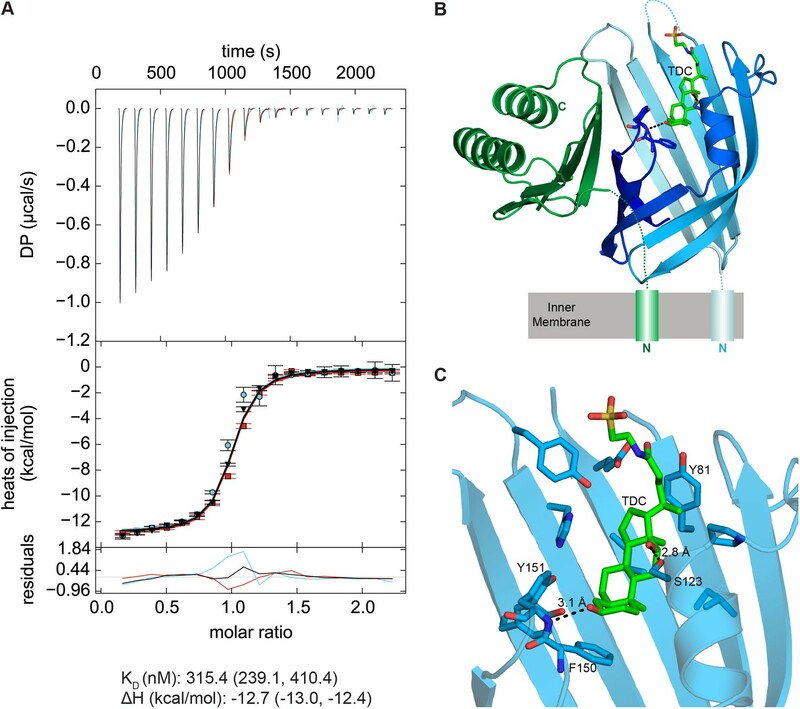 These results indicated that TDC binds to the VtrA/VtrC heterodimer in an exothermic manner (Figure 8), with a dissociation constant (KD) of 315.4 nM (Figure 8A). The stoichiometry of TDC binding to VtrA/VtrC is approximately 1:1 (n = 0.94). Taken together our results suggest that VtrA and VtrC form a functional complex that can bind bile salts. VtrA/VtrC periplasmic domain complex binds the bile salt taurodeoxycholate (TDC). (A) ITC-derived binding curves of the VtrA/VtrC complex with TDC. Thermodynamic parameters were determined by global fitting of triplicate isotherms (presented in black, red, and cyan). The dissociation constant (KD) and enthalpy (ΔH) values are reported followed by the 1σ error intervals in parenthesis. Data is representative of two independent experiments. (B) Structure of the VtrA/VtrC periplasmic domain complex binding TDC (green). VtrA and VtrC follow same coloring scheme as in Figure 6. 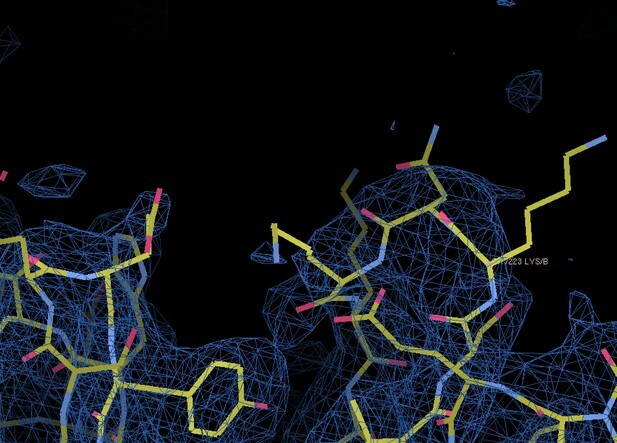 (C) Detailed view of the TDC binding site. Hydrogen bonds between protein and TDC are represented as dashed lines. We next purified the VtrA/VtrC heterodimer in the presence of the bile salt TDC and crystalized this complex and obtained its X-ray structure. The crystal structure was solved via molecular replacement by using our original VtrA/VtrC heterodimer as a search model, and refined to a resolution of 2.10 Å. The model reveals three VtrA/VtrC heterodimers in the asymmetric unit, each with clear electron density for one TDC molecule bound inside the β-barrel (Figure 8B, Figure 8—figure supplement 1A). A fourth TDC molecule mediated lattice contacts between VtrA chain A and its symmetry mate (Figure 8—figure supplement 1B). An analysis of the macromolecular interfaces found in this crystalline lattice by the web server PDBePISA (Krissinel and Henrick, 2007) indicated that the heterodimer is the only stable quaternary structure in solution. Although the three heterodimers in the asymmetric unit are highly similar, average root mean squared deviations (RMSD) of 0.5 Å for VtrA and 0.6–1.5 Å for VtrC indicates that there are differences in the VtrC monomer (Figure 8—figure supplement 2A,E). RSMD values of 0.4–0.5 Å for VtrA and 1.2–1.9 Å were obtained by superimposing each of the TDC-bound heterodimers to the apo structure (Figure 8—figure supplement 2B-–E), indicating that the overall fold is maintained but there are considerable changes in the VtrC monomer. The largest differences between the VtrA/VtrC-TDC and the apo heterodimers are in the VtrC disordered loop and Fα that follows it. In the VtrA/VtrC-TDC heterodimer, the disordered loop has been displaced by the TDC molecule and is now observable in two out of the three heterodimers in the crystallographic asymmetric unit. Residues Thr122 and Ser123, which were in the disordered loop in the apo structure, now form part of Fα in two of the TDC-bound heterodimers. Remarkably, one of these residues (Ser123) now forms a hydrogen bond with the 12α-hydroxyl group of TDC (Figure 8C). The main chain amide between F150 and Tyr151 (Hβ-Iβ loop) coordinates the 3α-hydroxyl group (Figure 8C), which is present in all bile salts, suggesting that this interaction is important for specificity towards bile salts. Several VtrC residues in the binding pocket maintain hydrophobic interactions with TDC, including the side chains of Phe150 with steroid ring A and Tyr81 with the hydrophobic part of the bile acid (Figure 8C). Based on our co-crystal structure of VtrA/VtrC with TDC, the role of several residues that contact the bile salt were investigated for their ability to affect the binding of bile salts and activation of the T3SS2 (Figure 9). The mutation of His50, located at the top of the hydrophobic cleft, to an arginine residue is expected to produce steric hindrance by insertion of a large side chain into the bile salt binding pocket (Figure 9A). When VtrC-H50R was expressed in the vtrC deletion strain and bile salts were added, the T3SS2 could not be induced as indicated by the lack of expression and secretion of the T3SS2 effector VopA (Figure 9B, lanes 5 and 11). We also changed Tyr81 to an alanine residue, which we predicted would disrupt bile salt binding by eliminating the interaction between the Tyr81 aromatic ring and the bile salt side chain (Figure 9A). When VtrC-Y81A was expressed in the vtrC deletion strain and bile salts were added, the T3SS2 was not induced as indicated by the lack of expression and secretion of VopA (Figure 9B, lanes 6 and 12). As a control, we chose to mutate a surface exposed residue, Gln42, to an alanine (Figure 9A). As expected, this mutant rescued the vtrC deletion strain and upon addition of bile salts the T3SS2 was activated as indicated by the expression and secretion of VopA (Figure 9B, lanes 4 and 10). To assess whether these mutations had any effect on the VtrA/VtrC complex formation, we co-immunoprecitated the complex with the N-terminal FLAG-tagged VtrC. As seen in Figure 9C, the wild type and mutant VtrC proteins formed a stable complex with endogenous VtrA, as indicated by their co-immunopreciptation. Mutations in the hydrophobic chamber of VtrA/VtrC heterodimer disrupt signaling mediated by bile salts. (A) Structure of VtrA/VtrC heterodimer. Q42, H50 and Y81 of VtrC are highlighted in yellow. (B) Restoration of T3SS2 activation in POR1ΔvtrC by VtrC mutant Q42A but not H50R or Y81A. Expression (Cell) and secretion (Sup) of V. parahaemolyticus T3SS2 effector VopA by POR1 derivative strains with the empty pBAD vector (Empty), vtrC deletion (ΔvtrC Empty), vtrC complementation by N-terminal FLAG-tagged wild type (ΔvtrC p-FLAG-vtrC) or mutant (Q42A, H50R or Y81A) VtrC that expresses pBAD vector induced protein under the arabinose inducible promoter. Protein-specific antibody was used to detect VopA. Anti-FLAG antibody was used to detect N-terminal FLAG-tagged VtrC. -/+ Bile, V. parahaemolyticus grown in LB without bile salts (-) or supplemented with 0.05% bile salts (+). Loading control (LC) is shown for total protein lysate. Dashed lines indicate lane that was deleted from the gel. (C) Co-IP demonstrating that all three VtrC mutants form a stable complex with VtrA. Bile sensing plays a significant role in human infection caused by various enteric bacterial pathogens (Begley et al., 2005). Deciphering how bacteria use bile as a signal to regulate the expression of virulence genes is essential to our understanding of disease mechanisms and also can offer insights for designing novel therapeutic strategies. Bile salt-induced T3SSs are the primary virulence factor in many Vibrio species (Broberg et al., 2011). In this study, we uncovered a previously unidentified component of a widespread, conserved signaling platform that is essential for bile salt sensing and activation of virulence factors in Vibrios. Our biochemical data and the structural analysis demonstrated that the periplasmic domains of the inner membrane proteins VtrA and VtrC form a stable complex that functions as a receptor for bile salts. The crystal structure of the VtrA/VtrC complex reveals that their periplasmic domains form a obligate heterodimer where VtrC folds into an open eight-stranded β-barrel and VtrA adopts a mixed α/β structure whereby one of its a β-strands contributes to the formation of the β-barrel. The VtrA/VtrC heterodimer fold is similar to members of the calycin superfamily, which contain eight to ten-stranded β-barrels that often bind hydrophobic molecules (Flower et al., 2000). Calycins have low sequence similarity, but relatively high structural conservation. They can be subdivided into several families based on structural details characteristic of each group (Figure 7) (Flower et al., 2000). Calycin families are markedly different in their distribution among biological kingdoms, cellular localization, and function, e.g. : (1) FABPs are cytosolic proteins involved in lipid homeostasis in animals, (2) MPIs are bacterial proteins that are secreted into the periplasm to inhibit metalloproteases, (3) lipocalins are found in both eukaryotes and prokaryotes, and they are mostly extracellular or attached to the outer membrane and bind a variety of ligands (Flower et al., 2000). In terms of structure, VtrC does not seem to cluster with any particular family and it forms its own clade (Figure 7). Although calycins have been found to form complexes with other proteins, our inspection of the available structures of complexes did not reveal any arrangement that resembled that of the VtrA/VtrC obligate heterodimer. This complex is unique for this family because it is formed from two proteins and it is a complex that transmits a signal upon binding its ligand. Interestingly, members of the FABP family have been found to bind bile salts. This is exemplified by human and porcine ileal lipid binding proteins (ILBPs), and their NMR structures in complex with taurocholate (Kurz et al., 2003) and glycocholate (Lücke et al., 2000), respectively. Analogous to VtrC's disordered loop and short α-helix, FABPs have a helix-turn-helix motif that forms a lid over one side of the barrel and is proposed to act as a portal for ligand access (Storch and McDermott, 2009). In the case of FABPs, it has been suggested that ligand binding induces subtle conformational changes that promote protein-membrane or protein-protein interactions (Storch and McDermott, 2009). We observe a similar scenario for the VtrA/VtrC obligate heterodimer bound to bile salts where, upon binding bile salt, it appears an unstructured loop is translocated from the inside of the hydrophobic chamber to the outside of the chamber, where it becomes structured. 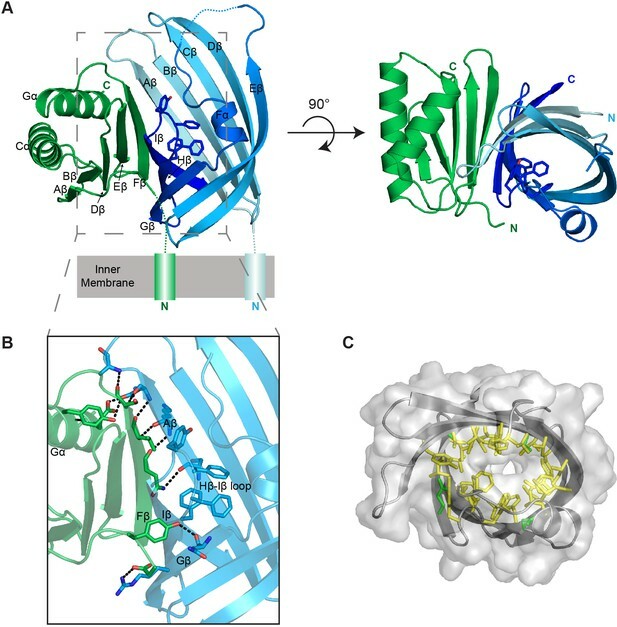 Future studies will focus on how a conformational change during bile salt binding may induce a switch in the VtrA/VtrC interaction that will result in activation of the VtrA cytoplasmic transcription activator domain (Figure 9). The closest example with regard to complex formation and function is the GrlR/GrlA complex, a regulator of the T3SS-encoding locus of enterocyte effacement (LEE) in enterohaemorrhagic and enteropathogenic E. coli strains (EHEC and EPEC, respectively) (Padavannil et al., 2013). GrlR is a cytosolic lipocalin that represses the LEE repressor GrlA by binding to its helix-turn-helix (HTH) domain. Similar to vtrA and vtrC, grlR and grlA are transcribed from a bicistronic operon, although the order of the lipocalin and transcriptional regulator genes is reversed in the latter pair. Analytical ultracentrifugation and the structure of GrlR in complex with the GrlA HTH domain revealed a heterotrimeric complex where a GrlR dimer binds one GrlA HTH monomer (PDB ID: 4KT5) (Padavannil et al., 2013). It has been shown that the inner cavity of GrlR binds lipids (Jobichen et al., 2009). However, the role of lipid binding in this system is unknown. Although GrlR and VtrC have analogous roles regulating T3SS through their interaction with a transcription factor, they do so from different cellular compartments at different stoichiometries, and their binding partners (GrlA HTH domain and VtrA periplasmic domain, respectively) have different folds. Several signaling features of VtrA/VtrC appear to parallel two other pairs of regulatory proteins found in V. cholerae, ToxR/ToxS and TcpP/TcpH, which control the expression of numerous virulence factors including CT and TCP. First, the genes encoding the proteins in each pair are arranged in bicistronic operons (Miller et al., 1989; Häse and Mekalanos, 1998). Second, VtrA/ToxR/TcpP and VtrC/ToxS/TcpH have the same cellular localization and membrane topology (Miller et al., 1989; Häse and Mekalanos, 1998; Miller et al., 1987). Third, VtrC, ToxS and TcpH affect the activity of VtrA, ToxR and TcpP, respectively. On this last point, we showed that VtrA and VtrC form a complex in vivo both before and after T3SS2 activation and in vitro through their periplasmic domains. Our data supports a model in which VtrA and VtrC form a complex both in the absence and presence of bile salts. Upon binding bile salts to the hydrophobic chamber in the VtrA/VtrC complex, the cytoplasmic DNA binding domain of VtrA is activated and in turn induces VtrB to activate the T3SS2 (Figure 10). The specific changes caused by binding bile salts and their effects on the VtrA DNA-binding domain are yet to be determined. Although VtrA contains no cysteine residues in its periplasmic domain, it is still possible that bile salts increase VtrA activity by inducing its dimerization or oligomerization, similar to what has been proposed for the ToxR/ToxS and TcpP/TcpH systems (Ottemann and Mekalanos, 1996; Yang et al., 2013). Model for bile salts sensing and T3SS2 regulation in V. parahaemolyticus. In the absence of bile salts, VtrA (green) and VtrC (blue) form a complex where the VtrA cytoplasmic DNA binding domain is kept inactive. Upon binding of bile salts, the VtrA/VtrC complex activates the VtrA DNA binding domain by a yet to be determined mechanism, which induces VtrB (purple) expression. VtrB, in turn, activates T3SS2. The VtrA/VtrC complex is highly conserved in a group of diverse Vibrionaceae family species, as well as in Moritella marina. While the bile salt-induced T3SS in V. cholerae non-O1/O139 strains is necessary for bacterial colonization and the primary cause of disease during infection (Chaand et al., 2015), the role of T3SS in G. hollisae infection is yet to be characterized. For other bacteria encoding vtrA, vtrC and vtrB, such as Photobacterium marinum and V. caribbeanicus, only a few T3SS related genes or no T3SS related genes are observed in their genomes, respectively. The differences between T3SS gene representation in these bacteria demonstrate this system's diversity and imply that the T3SS may be evolving in response to different living environments. Based on surrounding genes, this bile salt receptor complex may have adapted in other species to bind other hydrophilic ligands. For example, in the ten strains that lack a vtrB homolog but possess a vtrA/vtrC pair, the gene downstream of the vtrA/vtrC operon encodes a putative sphingomyelin phosphodiesterase. This enzyme is a hydrolase involved in the metabolism of sphingolipids (Goñi and Alonso, 2002) and is a putative virulence factor (Oda et al., 2012). It is tempting to hypothesize that the homologues of VtrA/VtrC in these bacteria function as a sensor for sphingolipids and regulate the induction of the downstream gene that produces sphingomyelin phosphodiesterase. In conclusion, using microbial genetics and biophysics, we have identified and characterized a bile salt sensor that is widely distributed and used to induce virulence by many Vibrios. Additionally, we have found that a family of monomeric lipid binding calycin domain proteins has expanded to include an obligate heterodimer that binds bile salts and can be used to transmit a signal. To our knowledge, our study provides the first biochemical and structural analysis of a prokaryotic receptor involved in mediating a response to bile salts, a significant environmental cue during infection. The V. parahaemolyticus clinical RimD2210633 derivative strain POR1 (ΔtdhAS) and its derivative strains were cultured in Marine LB (MLB) broth (LB broth containing 3% NaCl) or Marine minimal medium (MMM) at 30°C. E.coli DH5α, E.coli S17 (λ pir), B834(DE3), Rosetta 2(DE3), and BL21(DE3) were cultured in LB broth at 37°C. The medium was supplemented with kanamycin (30 μg/ml for E.coli and 240 μg/ml for V. parahaemolyticus) or chloramphenicol (25 μg/ml) when necessary. For vector induced expression of VtrC that is regulated by its native promoter, the 1kb upstream of vtrA followed by the vtrC coding sequence was PCR amplified and cloned into the pBAD/Myc-His vector (Invitrogen) in which ampicillin resistance was replaced with kanamycin resistance. To generate pBAD-FLAG-vtrCΔN30, vtrCΔN30 (aa 31–161) was amplified by PCR (a FLAG epitope was added via the forward primer) and cloned into pBAD/Myc-His under the control of the arabinose inducible promoter. Amino acid residues 1 to 30 are predicted to encode the N-terminal transmembrane region. Since membrane localization is predicted to be important for the activity of VtrC, the VtrCΔN30 mutant protein should localize to the cytoplasm and, thus, be inactive. PhoA and LacZ fusions to VtrC in pBAD/Myc-His were generated by PCR amplifying phoA (amino acids 22–471, lacking the endogenous signal peptide) and the full length lacZ (amino acids 1–1024) and cloning directly upstream of VtrC aa 1 for N-terminal fusions or downstream of VtrC's last residue (aa 161) for C-terminal fusions. To generate the vtrC deletion, the 1kb upstream and downstream of the nucleotide sequence for vtrC gene (nucleotides 34–486) to be deleted were cloned into the pDM4, a CmROriR6K suicide plasmid containing the sacB gene, which encodes an enzyme that metabolizes sucrose into a toxic product. C-terminal FLAG tag knock-in of vopD2 and vopS were generated by cloning the 1kb upstream of the knock-in site, followed by the nucleotide sequence encoding the FLAG tag and the 1kb downstream of the knock-in site into pDM4. The resulting pDM4 plasmids were conjugated into the POR1 strain from E. coli S17 (λ pir) and the transconjugants were selected on medium containing 25 μg/ml chloramphenicol. Bacteria were then counterselected by growing on medium containing 15% sucrose to select for clones were the suicide plasmid had recombined out of the chromosome. PCR analysis was performed to confirm successful deletions and knock-ins and that the vtrA gene remained intact. FLAG antibodies were purchased from Sigma-Aldrich (F3165 and F7425). Polyclonal antibodies were produced in house with rabbits for the recombinant proteins for VopA and VopC and for the VtrA peptide aa 235–253. In order to identify VtrA and VtrC homologues, we performed PSI-BLAST (Altschul et al., 1997) searches against a non-redundant (NR) database (threshold E-value cutoff 0.02) with query sequences corresponding to the predicted periplasmic domains of VtrA (VPA1332: gi|28901187, aa 150–253) and VtrC (VPA1333: gi|28901188, aa 27–161). Because our VtrC PSI-BLAST hits were from different species than our VtrA hits, we initiated a transitive PSI-BLAST search against the NR database (threshold E-value cutoff 0.01) using the most distant identified VtrA sequence as a query (gi|494726765, aa 160–272). The transitive search found the VtrA sequences from the remaining species containing VtrC. All identified VtrA and VtrC hits were found in tandem in their respective genomes, and representative sequences from non-redundant species were collected. VtrB sequences were identified by searching VtrA/VtrC-containing genomes for the VtrB sequence (VPA1348: gi|28901203). Due to widespread nature and strong conservation of the VtrB helix-turn-helix sequence in many transcription factors, we required VtrB orthologs to: 1. be the top-scoring hit in the respective genomes, 2. retain the predicted C-terminal transmembrane helix and 3. be in close proximity to the VtrA/VtrC gene pair. Representatives from each sequence family were aligned using the MAFFT server (http://mafft.cbrc.jp/alignment/server/). To calculate the structure-based distance tree, representative structures were chosen from the lipocalins/streptavidin group in the Evolutionary Classification Of protein Domain structures (ECOD) database. We chose structures with bound ligands, when available, from the main branches of the calycin superfamily (Flower et al., 2000): lipocalins (1kt7:1–175, 2aco:10–177), triabin (4n7c:3–176), fatty acid binding proteins (FABPs) (1o1v: 1–126, 3wvm:0–132), streptavidin (2f01:14–134), and metalloprotease inhibitor (MPI) (1jiw:1–105, chain I). We also included the HRI1 N-terminal domain structure (HRIN-like; 3rby:1–151) with a unique binding site that traverses the lipocalin-like barrel core, as well as the VtrC structure. The representative lipocalin-like domains were compared pairwise all-against-all using DaliLite (Holm and Park, 2000). Pairwise DaliLite Z-scores (ZAB) were transformed to distances by comparing to self DaliLite Z-scores (ZAA, ZBB) using the following equation: -ln(ZAB/(0.5*ZAA+0.5*ZBB)). The structure-based tree was produced using the FITCH program (with global optimization) of the Phylip package (Felsenstein, 1997). Total RNA was extracted from V. parahaemolyticus strains using RNeasy Plus Mini Kit (QIAGEN 74134). Extracted RNA was then reverse transcribed into cDNA using ProtoScript First Strand cDNA Synthesis Kit (NEB E6300S) utilizing Random Primer Mix. The resulting cDNA served as the template for quantitative RT-PCR analysis using iTaq Universal SYBR Green Supermix (Bio-Rad) and the ViiA7 Real-Time PCR System (Applied Biosystems). The 2-ΔΔCT method was used to determine the mRNA level of vtrA and vtrB in each sample relative to POR1 grown in LB without bile salts. The expression of vtrA and vtrB was normalized against the expression of fliA. Primers for specific genes were as follows: vtrA, 5’-TTGGAACCCACGAACATCTC-3’ and 5’-CAGTCACAAATTTTCCTGGCC-3’; vtrB, 5’-ATTATCAGCTTAGGTGGGCG-3’ and 5’-ACTTTACCCCACACTTTGTCG-3’; control gene fliA, 5’-AAGCGATAACCTATGACCAGC-3’ and 5’-TCCTCTACCTGAACACTCGG-3’. For the PCR that tests if vtrA and vtrC are cotranscribed, the cDNA served as the template and the primers used were: 5’- AATTGTTCCAGAAAGGCTCTATGTCATGCTTAATG’-3 and 5’- GTTTCATAAAAATGAACTGGTTGAAAAAAATTG-3’. V. parahaemolyticus strains were grown overnight in MLB at 30°C. For experiments that involved vector induced expression of VtrC under its endogenous promoter, overnight cultures were diluted to OD600 nm = 0.3 in LB supplemented with 0.05% bile salts or 0.5 mM individual bile acid taurodeoxycholate (TDC), glycodeoxycholate (GDC), chenodeoxycholate (CDC) or cholate (CA) and induced for 4 hr at 37°C. For experiments that involved vector induced expression of VtrC under the arabinose inducible promoter of pBAD, overnight cultures were diluted to OD600 nm = 0.6 in MLB supplemented with 0.1% arabinose and induced for 3 hr at 30°C. The cultures were then diluted to OD600nm = 0.3 in LB supplemented with 0.1% arabinose and 0.05% bile salts and induced for 4 hr at 37°C. For the expression fraction (cell), the same OD600 nm of bacterial cultures were collected and cell pellets were resuspended in 2x protein sample buffer (100 mM Tris·HCl pH 6.8, 20% glycerol, 2% sodium dodecyl sulfate (SDS), 2% β-mercaptoethanol, 150 mM sodium hydroxide, bromophenol blue). For the secretion fraction (sup), bacterial culture supernatants were filtered and precipitated with deoxycholate and trichloroacetic acid (Kimata et al., 2004). Precipitated proteins were pelleted and washed with acetone and then resuspended in 2x protein sample buffer. Protein expression and secretion were detected by western blot analysis. V. parahaemolyticus strains were grown overnight in MLB at 30°C. Overnight cultures were diluted to OD600 nm = 0.3 in LB or Dulbecco's Modified Eagle Medium (DMEM) and induced for 4 hr at 37°C. For the expression fraction (cell), the same OD600 nm of bacterial cultures were collected and cell pellets were resuspended in 2x protein sample buffer. For the secretion fraction (sup), bacterial culture supernatants were filtered and precipitated with deoxycholate and trichloroacetic acid (Kimata et al., 2004). Precipitated proteins were pelleted and washed with acetone and then resuspended in 2x protein sample buffer. Protein expression and secretion were detected by western blot analysis. The following strains were used for the Co-IP experiments on Figure 5C: V. parahaemolyticus strains POR1 + pBAD, POR1ΔvtrA + pBAD-FLAG-vtrC and POR1 + pBAD-FLAG-vtrC. The following strains were used for the Co-IP experiments on Figure 9C: V. parahaemolyticus strains POR1 + pBAD, POR1ΔvtrA + pBAD-FLAG-vtrC and POR1 ΔvtrC + pBAD-FLAG-vtrC wild type and mutants H50R, Y81A and Q42A. Strains were grown overnight in MLB at 30°C. Overnight cultures were diluted to OD600 nm = 0.6 in MLB supplemented with 0.1% arabinose and induced for 3 hr at 30°C. The cultures were then diluted to OD600 nm = 0.3 in LB supplemented with 0.1% arabinose and 0.05% bile salts and induced for 4 hr at 37°C. 200 ml bacterial culture were resuspended with lysis buffer (50 mM Tris·HCl pH 7.4, 100 mM NaCl, 0.2% Triton X-100, 5 mM EDTA, 1 mg/ml lysozyme and 1 mM PMSF). Resuspended samples were shaken at 22°C for 30 min and then subjected to three freeze/thaw cycles. The supernatant was collected after centrifugation at 25,000 x g, 4°C for 30 min. Immunoprecipitation was performed by incubating the supernatant with Anti-FLAG M2 beads at 4°C with gentle shaking for 4 hr. Beads were collected and washed with wash buffer (50 mM Tris·HCl pH 7.4, 100 mM NaCl, 0.2% Triton X-100) 3 times. Proteins bound to beads were eluted with 2x protein sample buffer. VtrA and VtrC were detected by western blot analysis using Anti-VtrA and Anti-FLAG antibodies. 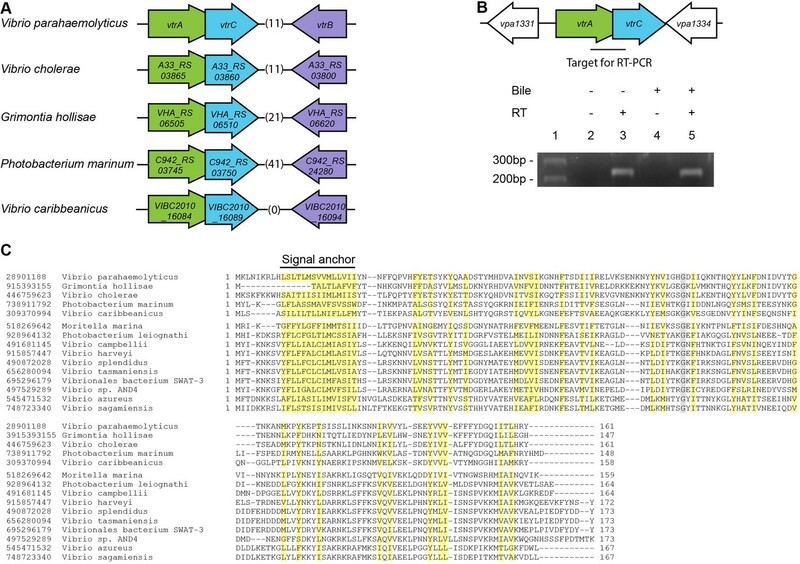 The periplasmic domain of VtrA (aa 161–253) was cloned as an N-terminally hexahistidine and maltose binding protein-tagged fusion protein into pET28b (Novagen) to produce pET28b-HisMBP-VtrA, which contains a Tobacco Etch Virus (TEV) protease cleavage site between the HisMBP-tag and VtrA. The pET28b-HisMBP-VtrA construct was expressed in E. coli Rosetta 2(DE3) cells (Novagen). For VtrC/VtrA coexpression, the periplasmic domains of VtrC (aa 31–161) and VtrA (aa 161–253) were cloned into the first and second multiple cloning site, respectively, of pACYCDuet-1 (Novagen) to produce pACYCDuet-VtrC/VtrA, where VtrC is N-terminally hexahistidine-tagged. The pACYCDuet-VtrC/VtrA construct was expressed in E. coli BL21(DE3) cells. All cultures were grown in LB at 37°C until OD600nm 0.5–0.6 and induced with 0.4 mM isopropyl β-D-thiogalactopyranoside (IPTG) overnight at 22°C for pET28b-HisMBP-VtrA, and 17°C for pACYCDuet-VtrC/VtrA. Selenomethionyl-derivatized VtrA/VtrC complex was expressed in E. coli B834(DE3) cells (Novagen) in SelenoMet medium (Molecular Dimensions). Cells were harvested by centrifugation, resuspended in buffer A (50 mM Tris pH 8.0 and 100 mM NaCl), and lysed by extrusion. Lysates were clarified by centrifugation and filtered (0.45-μm pore size). All proteins were purified by nickel-affinity purification using HisPur Ni-NTA resin (ThermoFisher, Rockford, Illinois) on a gravity flow column. Briefly, lysates were incubated with the resin for 30 min at 4°C with nutation. Lysate and beads were applied to the column and washed with 20 column volumes of buffer A supplemented with 15 mM imidazole. Proteins were eluted with 5 column volumes of buffer B (50 mM Tris pH 8.0, 100 mM NaCl and 250 mM imidazole). 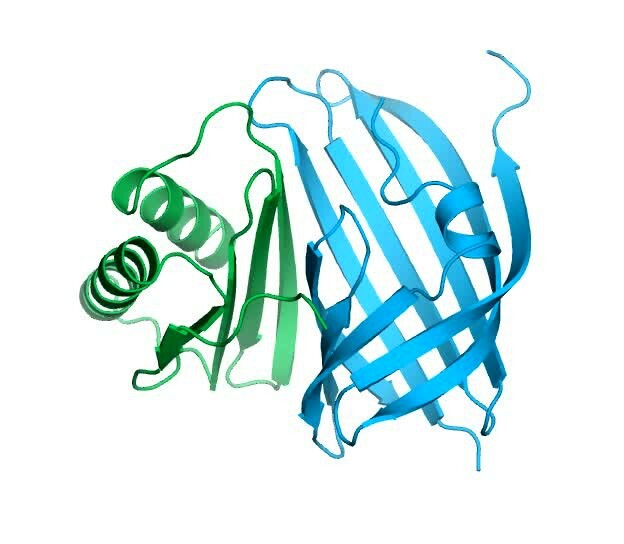 For VtrA, the HisMBP fusion domain was removed by treating with TEV protease overnight at 4°C, followed by a second round of nickel-affinity chromatography. Proteins were further purified by size exclusion chromatography (SEC) on a Superdex 75 16/600 column (Pharmacia Biotech) with buffer A. All proteins were buffer exchanged to 10 mM Tris pH 8 and 10 mM NaCl for crystallographic studies. Selenomethionyl-derivatized VtrA/VtrC complex was purified in a similar manner with the addition of 1 mM DTT to all buffers. Gel filtration was performed on a Superdex S75 16/600 column (Pharmacia Biotech) with buffer containing 50 mM Tris pH 8.0 and 100 mM NaCl at a flow rate of 1 ml/min. The protein complex solution was injected into the column at a final concentration of 1 mg/ml in a total volume of 1 ml. Fractions were analyzed by SDS-PAGE and Coomassie blue staining. For protein molecular weight determination, the column was calibrated with a gel filtration LMW calibration kit (GE Healthcare) using the running buffer described above. Crystals of native VtrA/VtrC periplasmic domain heterodimer were grown using the sitting-drop vapor diffusion method from drops containing 0.2 μl protein (13 mg/ml) and 0.2 μl reservoir solution (1.0 M lithium sulfate, 0.5 M ammonium sulfate, 0.1 M sodium citrate pH 5.6) and equilibrated over 50 μl reservoir solution at 20°C. Crystals of selenomethionyl-derivatized heterodimer were grown using the hanging-drop vapor diffusion method from drops containing 1 μl protein (10 mg/ml) and 1 μl of reservoir solution (1.0 M lithium sulfate, 0.5 M ammonium sulfate, 0.1 M sodium citrate pH 5.9) and equilibrated over 500 μl of reservoir solution. Crystals appeared after 2 days at 20°C and grew to their maximal extent by 1 week. Native and selenomethionyl-derivatized crystals were cryoprotected by transferring to a final solution of 28.7% ethylene glycol, 1.1 M lithium sulfate, 0.6 M ammonium sulfate, and 0.1 M sodium citrate pH 5.6–5.8, then the crystals were flash-cooled in liquid nitrogen. Crystals of the VtrA/VtrC heterodimer bound to the bile salt TDC were grown with protein that had been loaded with TDC by performing purification in the presence of 0.5 mM TDC in all buffers and buffer exchanging into 10 mM Tris pH 8, 10 mM NaCl. Drops containing 1 μl protein (5 mg/ml) and 1 μl of reservoir solution (2.0 M ammonium sulfate, 0.1 M sodium acetate pH 4.6) were set up by the hanging-drop vapor diffusion method, and equilibrated over 500 μl of reservoir solution. Crystals appeared after 6 days at 20°C and grew to their maximal extent by 2 weeks. Crystals were cryoprotected by transferring to a final solution of 22.5% ethylene glycol, 2.1 M ammonium sulfate, 0.1 M sodium acetate pH 4.6, and 0.5 mM TDC, and flash-cooled in liquid nitrogen. Data were collected at APS beamline 19-ID at 100 K, and were indexed, integrated and scaled using the HKL-3000 program package (Minor et al., 2006). Native and selenomethionyl-derivatized VtrA/VtrC heterodimer crystals exhibited the symmetry of space group F432 with unit cell parameters of a = 211.01 Å and contained one molecule each of VtrA and VtrC per asymmetric unit, with a solvent content of 65%. TDC-containing crystals belonged to space group P212121 with unit cell parameters of a = 55.39 Å, b = 71.28 Å and c = 203.73 Å and contained three molecules each of VtrA/VtrC heterodimer per asymmetric unit, with a solvent content of 50%. Native, selenomethionyl-derivatized and TDC-containing crystals diffracted isotropically to a dmin of 2.70 Å, 2.60 Å and 2.10 Å, respectively, when exposed to synchrotron radiation. Data collection statistics are provided in Table 1. Data collection and refinement statistics, VtrC/VtrA complex. (chain ID) VtrA(A): 161– 163. VtrC(B): −13 –0, 113–117. VtrA(A): 161–164. Data for the outermost shell are given in parentheses. *Bijvoet-pairs were kept separate for data processing. †Rmerge=100∑h∑i∣ Ih,i−⟨Ih⟩∣/∑h∑i⟨Ih,i⟩, where the outer sum (h) is over the unique reflections and the inner sum (ii) is over the set of independent observations of each unique reflection. ‡Rpim is the precision indicating R-factor, i.e Rpim=100∑h∑i[1/(nh−1)]1/2∣Ih,i−⟨Ih⟩∣/∑h∑i⟨Ih,i⟩, where nh is the number of observations of reflections h (Evans, 2011). §B-factor sharpening was performed in the autocorrection mode of HKL3000 (Borek et al., 2013). #Asdefined by the validation suite MolProbity (Chen et al., 2010). Phases for the native VtrA/VtrC heterodimer were obtained from a two-wavelength anomalous dispersion experiment using selenomethionyl-derivatized heterodimer protein with data to a dmin of 2.60 Å. 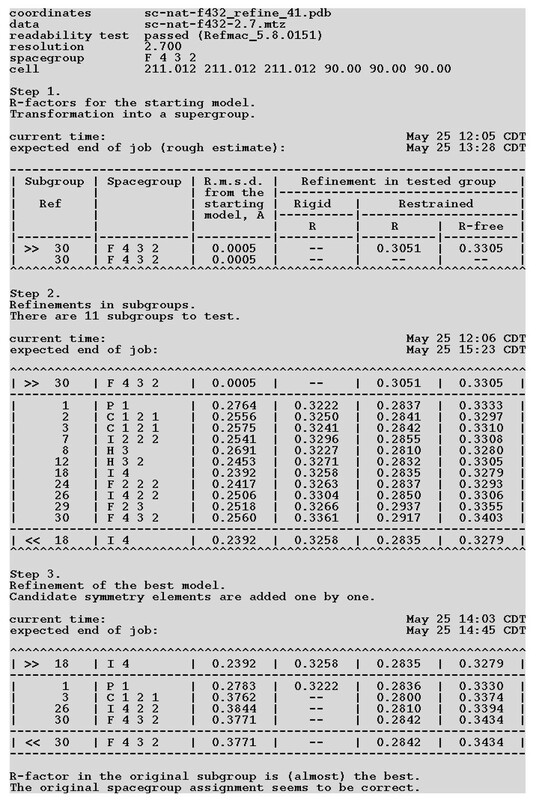 Two selenium sites were located using the program SHELXD (Schneider and Sheldrick, 2002), and phases were refined with the program Mlphare (Otwinowski, 1991), resulting in an overall figure-of-merit of 0.25 for data between 121.8 and 2.60 Å. Phases were further improved by density modification in the program Parrot (Cowtan, 2010) resulting in a figure-of-merit of 0.88. An initial model containing 84% of all VtrA/VtrC heterodimer residues was automatically generated in the program Buccaneer (Cowtan, 2006). As the selenomethionyl-derivatized and native crystals were isomorphous, all further calculations for the native structure were performed versus the native data. Additional residues for the VtrA/VtrC heterodimer were manually modeled in the program Coot (Emsley et al., 2010). Positional and isotropic atomic displacement parameter (ADP) as well as TLS ADP refinement was performed to a resolution of 2.70 Å using the program Phenix (Afonine et al., 2010) with a random 10% of all data set aside for an Rfree calculation. The current model contains one VtrA/VtrC heterodimer; included are residues residues 164–253 of VtrA 31–112 and 118–161 of VtrC, and one sulfate ion. The Rwork is 0.260, and the Rfree is 0.298. A Ramachandran plot generated with Molprobity (Chen et al., 2010) indicated that 94.3% of all protein residues are in the most favored regions and 0.5% (one residue) in disallowed regions. Phases for the TDC-containing heterodimer were obtained by the molecular replacement method in the program Phaser (McCoy et al., 2007) using the coordinates for the native VtrA/VtrC heterodimer. Model building and refinement were performed to a resolution of 2.1 Å using a similar protocol to the native structure. Four TDC molecules were located in the asymmetric unit, one each bound to the VtrC monomer of a VtrA/VtrC heterodimer and one at a lattice contact between VtrA molecules. The current model contains three VtrA/VtrC heterodimers in the asymmetric unit, four TDC molecules, seven sulfate ions and 204 water molecules. A Molprobity (Chen et al., 2010) generated Ramachandran plot indicates that 96.5% of all protein residues are in the most favored regions and 0.3% (two residues) in disallowed regions. Phasing and model refinement statistics for all structures are provided in Table 1. The VtrA/VtrC periplasmic domain complex was dialyzed at 4°C overnight against the assay buffer (50 mM Tris pH8, 100 mM NaCl). Taurodeoxycholic acid (400 μM) was prepared by dissolving the dry powder (Sigma) with the same dialysis buffer. ITC experiments were performed at 25°C on a MicroCal iTC200 system (Malvern), with reference power at 5 μcal/s and stirring rate at 750 rpm. Measurements were performed as 19 injections of 400 μM taurodeoxycholic acid (1 μl for the first injection and 2 μl for injections 2–19) into approximately 200 μl of 36 μM VtrA/VtrC. ITC data were integrated and analyzed using NITPIC 1.1.5 (Keller et al., 2012; Scheuermann and Brautigam, 2015) and ITCsy version 1a (Brautigam et al., 2016). ITC data plots were prepared with GUSSI 1.1.0 (Brautigam, 2015). Acta Crystallographica. Section D, Biological Crystallography 66:1153–1163. Journal of Synchrotron Radiation 20:37–48. Microbes and Infection / Institut Pasteur 13:992–1001. Acta Crystallographica. Section D, Biological Crystallography 62:1002–1011. Acta Crystallographica. Section D, Biological Crystallography 66:470–478. The Journal of Infectious Diseases 181:1661–1666. Vibrio parahaemolyticus virulence determinants, The Comprehensive Sourcebook of Bacterial Protein Toxins, Waltham, Elsevier, 10.1016/b978-0-12-800188-2.00008-2. Proceedings of the National Academy of Sciences of the United States of America 102:3465–3470. Microbiology and Molecular Biology Reviews 62:1301–1314. Biochimica Et Biophysica Acta 1482:9–24. Proceedings of the National Academy of Sciences of the United States of America 102:3028–3033. Proceedings of the National Academy of Sciences of the United States of America 95:730–734. Current Opinion in Microbiology 6:186–190. Proceedings of the National Academy of Sciences of the United States of America 112:10798–10803. Methods in Molecular Biology 235:289–296. European Journal of Biochemistry 267:2929–2938. The New England Journal of Medicine 353:1463–1470. Acta Crystallographica. Section D, Biological Crystallography 62:859–866. Frontiers in Cellular and Infection Microbiology 3:114. In: W Wolf, P. R Evans, A. G. W Leslie, editors. Proceedings of the CCP4 Study Weekend. Daresbury Laboratory: Science & Engineering Research Council. pp. 80–86. FEMS Immunology and Medical Microbiology 41:177–185. Acta Crystallographica. Section D, Biological Crystallography 58:1772–1779. Journal of Lipid Research Suppl:S126–S131. Diseases of Aquatic Organisms 105:45–55. The Journal of Biological Chemistry 279:51953–51957. Microbiology and Molecular Biology Reviews 64:13–33. Frontiers in Cellular Infection Microbiology 3:110. Proceedings of the National Academy of Sciences of the United States of America 110:2348–2353. Current Opinion in Microbiology 16:70–77. Thank you for submitting your work entitled "Bile Salt Receptor Complex Activates a Pathogenic Type III Secretion System" for consideration by eLife. Your article has been reviewed by two peer reviewers, and the evaluation has been overseen by a Reviewing Editor and Richard Losick as the Senior Editor. The following individuals involved in review of your submission have agreed to reveal their identity: Alejandro Buschiazzo (Reviewer #2). The reviewers and editor found the work intriguing. However, there was unanimity in the feeling that the manuscript did not provide an understanding of bile recognition in the investigated signal transduction pathway. Moreover, there were several technical and conceptual issues that are detailed in the comments presented below. Li P et al. report the discovery of a new protein (VtrC) as an essential element to regulate type three secretion system 2 in Vibrio. VtrC is shown to form a complex with VtrA, which is responsive to bile (a known inductor of T3SS2, ultimately modulating virulence). VtrA and VtrB had already been identified as essential T3SS2 regulators, but the mechanism of bile sensing and signal transduction remains unknown, and this is the main question the authors want to address. 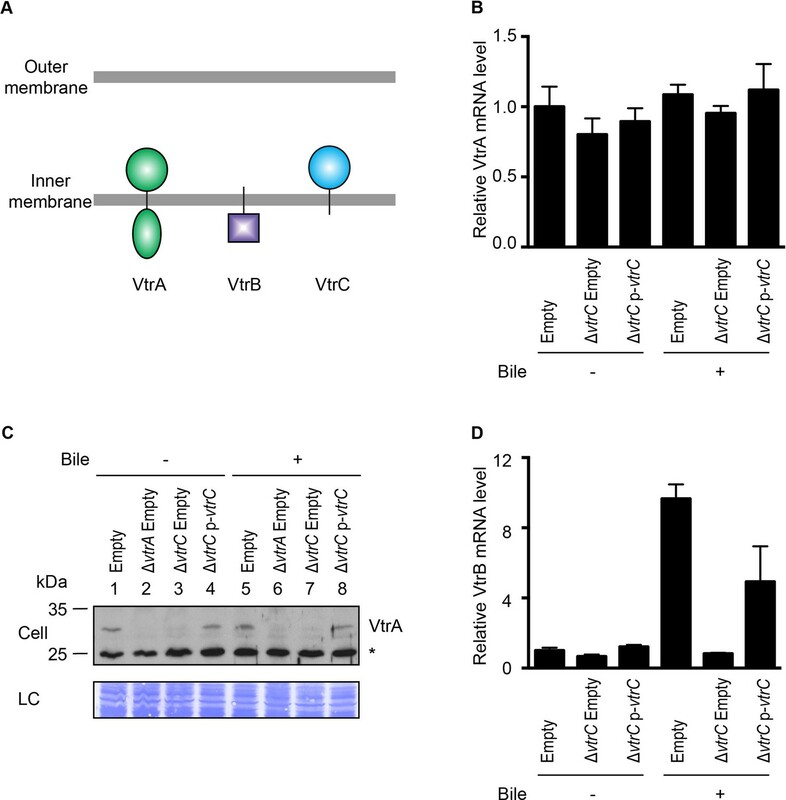 After identifying VtrC, the authors demonstrate that vtrA and vtrC belong to a single operon and, elegantly, that deletion of vtrC specifically affects T3SS2 and bile sensitivity. VtrC is further characterized as a bitopic membrane protein, which led to uncovering periplasmic interaction with VtrA in vivo (co-IP). Not affecting vtrA transcription, VtrC appears to be critical for VtrA protein stability. 2) The crystal structure of the VtrA/VtrC complex represents an important contribution, confirming the association between both proteins. • Stereochemical rmsd figures for bond lengths and angles are extremely low. Why? Were extra-tight restraints used during refinement? if yes, why? Please briefly address these points in the Materials and methods. 3) Are there other, alternative, heterodimer architectures (or yet, tetrameric organizations etc) in the cubic packing? Please cite the next best inter-protomer buried interface surface, ruling out otherwise ambiguous oligomeric choices. 4) The structural data don't seem to contribute all that much into a mechanistic understanding. Particularly, the ligand-binding site cannot be pinpointed as the authors admit. Did the authors attempt crystallizing the complex in the presence of TDC or other potential ligands? Make this explicit. Structurally assessing how VtrA-VtrC recognizes bile would be a major mechanistic insight (see next). 5) TDC is used as the sole ligand assayed by ITC, based on a previous report, but bile is really heterogeneous. The authors would benefit of incubating the complex with bile, then purifying and crystallizing (also MS can be helpful), attempting to see and/or identify ligands, which may not be TDC. Actually, the authors claim that TDC binds with nM affinity, which is somewhat misleading. KD is actually on the low microM range (i.e. nearer microM than nM, in contrast to most FABPs used as reference in Richieri et al. 2000 Biochemistry). "Nanomolar" should thus be changed to "low μM" in the Abstract and Discussion. Maybe other bile components bind tighter and are relevant physiologically? 6) Structural data would also be valuable to understand the critical role of interacting residues in the VtrA/VtrC interface. Structure-based mutants of vtrC can be analyzed on the vtrC-knockout background by the kind of functional assays that the authors have performed. 7) The major concern overall for the paper is indeed the mechanistic insight, which was the main question the authors sought to answer in the first place. Figure 9 is too vague: which bile component(s) binds physiologically? If it were TDC, where does it bind on the VtrA/VtrC complex? What are the characteristics of the signal-triggered rearrangement of VtrA (and/or VtrC)? Alternative hypothesis: VtrC stabilizes (somehow) VtrA, but it is VtrA on its own that binds bile components and transduces the signal. Given that recombinant VtrA's periplasmic domain is available, it would be important to assess its own capacity to bind TDC (using ITC). And, if really no binding is detectable, did the authors attempt crystallizing the VtrA periplasmic domain on its own? This structure could well inform about VtrC-triggered rearrangements. This manuscript by Li et al. describes research that increases understanding of how bile induces Type Three Secretion in Vibrio parahaemolyticus. It had previously been shown that the proteins VtrA and VtrB were necessary for bile-mediated induction of the T3SS2 system, and VtrA activated VtrB in response to bile. This paper identifies a new component of this system, VtrC, that is in the membrane associated with VtrA. 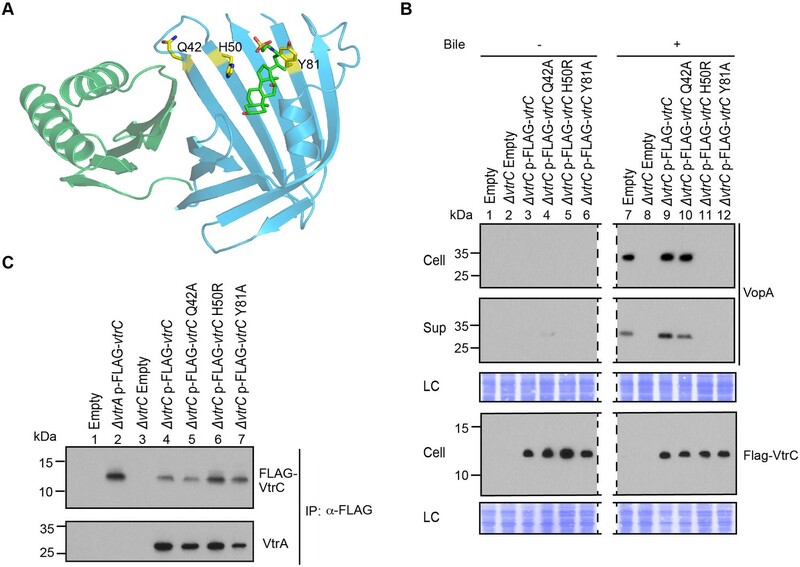 The authors crystalize the periplasmic interacting domains of VtrA and VtrC, in the absence of bile, and show the complex binds bile. This is a nice manuscript that definitely increases our understanding of this process, but I feel the authors overstep a bit in terms of the novelty of this work and their conclusions that they provide mechanistic insight into this process. Therefore, my enthusiasm is somewhat tempered. 1) The authors state that "the mechanism of bile sensing by these bacteria remains elusive". From the introduction, it would seem that not bile responsive proteins have been identified, or the impact of bile on these proteins elucidated. However, in Vibrio cholerae ToxT binding to bile inhibits its ability to bind target promoters, and as the authors state in the discussion bile has been shown to induce disulfide bonds in ToxR. 2) The authors don't really uncover the mechanism of VtrAC bile sensing, but just another important component of the system. For instance, I was surprised that the authors did not use the crystal structure to engineer mutations that would be predicted to disrupt the interaction or disrupt the binding to bile. Moreover, no structures are determined with bile, and they only identify the structure of the periplasmic domains, so how bile binding is transduced to changes in DNA binding affinity is not understood. They clearly make important advances, but this manuscript does not provide the mechanism of bile sensing. Thank you for resubmitting your work entitled "Bile Salt Receptor Complex Activates a Pathogenic Type III Secretion System" for further consideration at eLife. Your revised article has been favorably evaluated by Richard Losick (Senior editor), a Reviewing editor, and two reviewers. The authors should be aware that the F432 cubic space group is extremely rare in protein crystal structures (~200 entries belonging to it, among the >105 structures in the PDB). So, although possible to encounter, as with any unusual discovery, one should be extra cautious to avoid mistakes. For the next few comments, you might want to check whether your space group assignment was correct (or could there be a form of pseudo-symmetry?). Pseudo-symmetry often results in regions of the alleged ASU with weak electron density and greater difficulty in model building. This is why I had asked previously about how good the electron density is, not only in the good parts, but also in the bad ones (the authors misunderstood replying only with the obvious: that density is better in the core and worse in the flexible solvent-exposed regions). A mistake in the space group could end up being worrisome in giving parts of the model wrong (even on top of parts that are right). The new structure in complex with TDC, is in part reassuring (a confirmation with different packing), but some figures of its own, also raise questions. 1) Phasing FOM too low: 0.25 is suspicious for a MAD experiment. Could be explained because of too little anomalous signal (e.g. only two methionines for approx. 200 residues – probably a quite tough phasing scenario). Again, my point was to think (and test!) whether there is a lower symmetry possibility to integrate the data in, and then see if shelxd works better. Straightforward tests that you can also perform to scrutinize this SG assignment: a) use ccp4 program zanuda to analyze your cubic data, it will systematically test for lower compatible space group choices (and also perform some initial refinement for each, to have comparative figures); b) reintegrate the cubic data in P1, and perform mol replacement now that you have a solution (which is maybe completely right, or at least partially right for sure), searching for as many hetero-dimers as you calculate according to the triclinic unit cell volume: if a solution is found, than you can analyze if the packing indeed conforms to a such highly symmetric space group as F432. 2) Maybe it is cubic, end of story. 3) But, if alternative choices do appear, not only shelxd might give better FOM, but actually maps may turn out better (in the bad parts, if there were); final refined average B factors closer to Wilson B (this is a definitely strange behavior reported in your table); better Rmerge statistics (also high, not only in the high resolution shell, but also in the low res – I know high multiplicity is here at play, so I do not want to say this is necessarily wrong: just look closely and critically at it, to avoid mistakes). 4) I would strongly advise against including hydrogen atoms in the refinements. Else, explain really well why you think it's OK to include them. This goes also for the orthorhombic form with TDC. The validation reports seem clear in that you have included them: to support a refinement strategy with independent H atoms you would need ultra-high resolution (i.e. better than 1.2Å) or a neutron light source for the diffraction experiment. 5) The nominal resolution for the new orthorhombic structure is probably not 2.1Å: very low completeness of the data (57% high res shell). Please reconsider this. Actually, please elaborate as to why completeness drops significantly comparing the processed data vs those used for refinement. It is suggested to reduce/simplify subsection “The VtrA/VtrC complex is an obligate heterodimer”; it's enough there to indicate that only 2 Se-Met out of the 5 present in the protein complex, were ultimately seen to be ordered in the refined model, hence contributing proportionally little to the measured anomalous signal in the first place (likely explaining the low FOM figure at the phasing step, previous to density modification). In this context it is rather misleading to state that the 2 Se-Met "were used for refinement", actually you are probably talking here about their use to solve the substructure of anomalous scatterers for subsequent protein phasing purposes. VtrC is further characterized as a bitopic membrane protein, which led to uncovering periplasmic interaction with VtrAin vivo (co-IP). Not affecting vtrA transcription, VtrC appears to be critical for VtrA protein stability. We made a peptide antibody to the most antigenic region of VtrA found on its C-terminus and used this reagent in many of our studies. We agree with the reviewer that the possibility exists that the C-terminal fragment of VtrA could be degraded and we would miss this with our antibody. To avoid confusion, we have rephrased the following sentence "Taken together, VtrC appears to function upstream of VtrB through a mechanism that may involve stabilizing VtrA." to "Thus, VtrC appears to function upstream of VtrB via a signaling cascade including VtrA. The observed disappearance of VtrA in the absence of VtrC could support a direct physical interaction between VtrA and VtrC." This hypothesis is then validated by our structural studies with the VtrA/VtrC complex. The quoted Figure of Merit (FOM) of 0.25 was calculated at the end of phasing and thus is not inflated due to assumptions made during density modification. The FOM after density modification was 0.88; this is clearly stated in the Materials and methods section, “Phase determination and structure refinement. Extensive efforts were made to appropriately model the native apo structure in the F432 space group. Several factors contribute to the Rfree value observed in this structure, including the high solvent content (66%), the presence of a significant percentage of disordered and therefore unmodeled residues at the N-termini of both VtrA and VtrC as well as the disordered loop of VtrC (9% of all residues in the asymmetric unit), a lack of sidechain density for a significant number of residues on the solvent-exposed surface of the heterodimer, as well as significant differences in the mean B-values between VtrA and VtrC (62 Å2 vs. 77 Å2, respectively). Despite these issues, the observed Rfree is within acceptable limits for the observed high resolution limit of the data (Kleywegt G.J. and Brünger A.T. (1996) Checking your imagination: applications of the free R value. Structure4:897-904). The “best” electron density map regions correspond to the hydrophobic core of each monomer, while the “worst” regions correspond to the surface of the heterodimer that is exposed to the bulk solvent. Standard methods were used to refine the model in PHENIX, including the automated optimization of the weights for the X-ray observations/stereochemistry and X-ray observations/ADP (atomic displacement parameters). This optimization balances the results of minimization of Rwork and Rfree with the stereochemical and ADP restraints, and prevents chemically unreasonable geometry distortions. Given the medium-low resolution of the dataset plus the high solvent content (as discussed in the previous point) as well as the excellent geometry of the final model, it appears that PHENIX has done an appropriate job in this case. An analysis of the macromolecular interfaces found in the native apo structure in the F432 space group by the web server PDBePISA (http://www.ebi.ac.uk/pdbe/pisa/pistart.html) (E. Krissinel and K. Henrick (2007). 'Inference of macromolecular assemblies from crystalline state.'. J. Mol. Biol. 372, 774--797) was performed. Results indicate that the VtrA/VtrC heterodimer is the most stable quaternary structure in solution. The analysis yields a buried surface area of 2,300 Å2 between VtrA and VtrC, with ∆Gint = -9.6 kcal/mol (∆Gint is the free energy gain due to bringing the subunits together into a complex), ∆Gdiss = 3.1 kcal/mol (∆Gdiss is the free energy of dissociation), plus two salt bridges and ten hydrogen bonds at the interface. All other potential oligomeric assemblies, despite having similar or larger buried surface areas, had unfavorable (negative) values of ∆Gdiss and were biologically incompatible with the requirement that all VtrA and VtrC proteins must be anchored into the same membrane by N-terminal helical segments on each protein. In addition, these alternative assemblies are not observed in the native bile-salt bound crystalline lattice, space group P212121. We have solved the structure of the VtrA.VtrC complex bound to TDC and this has indeed provided “major mechanistic insight”. 5) TDC is used as the sole ligand assayed by ITC, based on a previous report, but bile is really heterogeneous. The authors would benefit of incubating the complex with bile, then purifying and crystallizing (also MS can be helpful), attempting to see and/or identify ligands, which may not be TDC. We have included a new supplemental figure, Figure 5—figure supplement 1, showing the activation of T3SS2 by specific bile salts. Previously, Gotoh et al. (2010) established that bile salts are the component of bile that activates the T3SS2. We have recapitulated this data, and shown that the bile salt TDC is an activator of this system. Therefore, we used TDC for our biophysical analysis of the VtrA/VtrC complex. Actually, the authors claim that TDC binds with nM affinity, which is somewhat misleading. KD is actually on the low microM range (i.e. nearer microM than nM, in contrast to most FABPs used as reference in Richieri et al. 2000 Biochemistry). "Nanomolar" should thus be changed to "low μM" in the Abstract and Discussion. Maybe other bile components bind tighter and are relevant physiologically? In Richieri's paper, they tested FABPS from different sources against a variety of fatty acids by the ADIFAB fluorescence method. Depending on the specific FABP and fatty acid combination, Kd values varied from 2-367 nM. The affinity of Vtra/VtrC for TDC is comparable with the higher end of this range. Previous work by Gotoh at al. and new supplemental Figure 5—figure supplement 1 demonstrate that TDC is a physiologically relevant molecule for this system. We have addressed this comment with experiments in Figure 9 that show changing amino acids within the ligand-binding pocket disrupts bile salt mediated signaling, as this is the focus of this paper. Future studies will include mutations that address signal transduction mediated by bile salt binding; however, these studies are clearly beyond the scope of this paper. Parenthetically, early in our studies we tried to see if recombinantly purified VtrA could bind bile salts using ITC. We saw no binding (Figure 1). After solving the structures of the VtrA/VtrC complex +/- bile salts and realizing it exists as an obligate heterodimer, we saw no reason to include this negative data. We have excluded the general statement “bile sensing by these bacteria remains elusive”. We have included studies that have implicated bile salts in ToxT signaling. However, receptors involved in sensing bile salts and activating T3SS2 were unknown before this study. We have solved the co-crystal structure of VtrA/VtrC with bile salts. As predicted, it binds in the hydrophobic chamber of the VtrA/VtrC complex. Mutant experiments that corroborate this observation are also included in Figure 9. Showing how bile binding is transduced to changes in DNA binding affinity of a transcription factor is work that we will address in the future and is out of the scope of this manuscript. For the next few comments, you might want to check whether your space group assignment was correct (or could there be a form of pseudo-symmetry?). Pseudo-symmetry often results in regions of the alleged ASU with weak electron density and greater difficulty in model building. This is why I had asked previously about how good the electron density is, not only in the good parts, but also in the bad ones (the authors misunderstood replying only with the obvious: that density is better in the core and worse in the flexible solvent-exposed regions). The authors have now provided two figures, Author response image 1 and 2 illustrating good versus poor electron density in the structure, as exemplified by the lack of density for the high percentage of solvent-exposed side chains (solvent content of the lattice is 68%). Typical good quality electron density as seen in the β-sheet of VtrA. Shown is the 2mFo-DFc map (this is a σA-map, where m is the figure of merit, and D is the model error and scale between Fo and Fc) (Afonine PV, Grosse-Kunstleve RW, Echols N, Headd JJ, Moriarty NW, Mustyakimov M, Terwilliger TC, Urzhumtsev A, Zwart PH, Adams PD. (2012) Towards automated crystallographic structure refinement with phenix.refine. Acta Crystallogr D Biol Crystallogr 68:352-367. ), from the final round of refinement in PHENIX contoured at the 1.0 σ level. Typical poor density as seen at the solvent-exposed surface of VtrA. Shown is the 2mFo-DFc map from the final round of refinement in PHENIX contoured at the 1.0 σ level. A mistake in the space group could end up being worrisome in giving parts of the model wrong (even on top of parts that are right). The new structure in complex with TDC, is in part reassuring (a confirmation with different packing), but some figures of its own, also raise questions. The authors are acutely aware that F432 is a rather unusual space group, and spent much time and effort to rule out other possibilities. There is no twinning possible in the space group F432, but it is possible for lower symmetry space groups. A summary of the extensive analysis is now presented. f) In addition, the output from PHENIX indicated that the point group of the lattice is F432, and explicitly stated there was no evidence that the lattice displays pseudosymmetry. Pseudosymmetry typically manifests as systematically weak classes of reflections (for example, h + k = 2n reflections that are systematically weak) (Zwart P.H., Grosse-Kunstleve R. W., Lebedev A. A., Murshudov G. N., Adams P. D. (2008) Surprises and pitfalls arising from (pseudo)symmetry. Acta Crystallogr D Biol Crystallogr 64:99-107; Li W., Ma C., Guan R., Xu Y., Tomchick D.R., Rizo J. (2011) The crystal structure of a Munc13 C-terminal module exhibits a remarkable similarity to vesicle tethering factors. Structure, 19:1443-1455). When the data is scaled and merged in HKL3000 in Laue class m3 (i.e., space group F23), there is no sign of pseudosymmetry in the reflections (i.e., no systematically weak classes of reflections are observed), and the discrepancy indices (i.e., the “R-factors”) are virtually indistinguishable from those obtained when the data is scaled and merged in Laue class m3m (i.e., space group F432). Thus we conclude that the correct space group is in fact F432. 1) Phasing FOM too low: 0.25 is suspicious for a MAD experiment. Could be explained because of too little anomalous signal (e.g. only two methionines for approx. 200 residues – probably a quite tough phasing scenario). Again, my point was to think (and test!) whether there is a lower symmetry possibility to integrate the data in, and then see if shelxd works better. In this table, the FOM estimate if the sub-structure (i.e., the Se sites) is solved is 0.3 (+/- 0.1). The P(Substr) is the estimate of probability that the sub-structure can be found with the heavy atom routine HYSS using the anomalous peak data (Terwilliger TC, Bunkóczi G, Hung L-W, Zwart PH, Smith JL, Akey DL, Adams PD (20160 Can I solve my structure by SAD phasing? Anomalous signal in SAD phasing. Acta Crystallogr D Biol Crystallogr 72:346-358). The FOM after density modification in the program Parrot was 0.88, which was expected given that the solvent content of the lattice is 68%. The resulting map was sufficient for an automatic model building routine (Buccaneer) to accurately trace and assign sequence to 200 of 238 possible amino acids, or to 93% of all residues in the final model. Thus we believe that this model and space group are correct. Straightforward tests that you can also perform to scrutinize this SG assignment: a) use ccp4 program zanuda to analyze your cubic data, it will systematically test for lower compatible space group choices (and also perform some initial refinement for each, to have comparative figures); b) reintegrate the cubic data in P1, and perform mol replacement now that you have a solution (which is maybe completely right, or at least partially right for sure), searching for as many hetero-dimers as you calculate according to the triclinic unit cell volume: if a solution is found, than you can analyze if the packing indeed conforms to a such highly symmetric space group as F432. The authors performed this test, and a screenshot of the log file is shown below. The space group F432 appears to be the correct one (Zanuda reports larger R-free values than reported for the final round of model refinement, as it makes no TLS B-factor corrections to the model). This suggestion is redundant to the analysis performed in Zanuda and thus the authors have not performed this test. An extensive discussion with one of the authors of HKL3000 (Zbyszek Otwinowski) reveals the nature of the confusion regarding the Wilson B-factor. The data was scaled in HKL3000 using the autocorrections routine, which performs extensive B-factor sharpening; only the sharpened B-factors were originally reported. The unsharpened Wilson B-factors for all datasets are now included in Table 1. For the SeMet and native F432 structures, the unsharpened Wilson B-factors are 77.6 to 79.0, very similar with the observed mean B-values for the refined model. It is a well-known consequence of high multiplicity (in the case of the native model, 36-fold) that the values for Rmerge will be artificially higher than expected, even though the merged data are improved by averaging more observations. This is the reason that reported in Table 1 are values for Rpim, the precision indicating R-factor (Evans P.R. (2011) An introduction to data reduction: space group determination, scaling and intensity statistics. Acta Crystallogr D Biol Crystallogr 67:282-92. ), which estimates the data quality after merging. These values are roughly a factor of 6-fold lower than the Rmerge values, and we think these values more accurately reflect the quality of the native data set. In addition, the CC1/2 value for the highest resolution shell (0.934) generously exceeds that recommended as a suitable high-resolution cutoff limit (Diederichs K. and Karplus P.A. (2012) Linking crystallographic model and data quality. Science 336:1030-1033). Modern methods of macromolecular crystallographic refinement encourage the inclusion of hydrogen atoms at ALL resolutions. These hydrogen atoms are not located independently in an electron density map and refined independently of the non-hydrogen atoms in the model; rather, they are placed in geometrically idealized conformations with relation to the non-hydrogen atoms they are covalently bonded to and during positional refinement they are tied to their bonded atoms. These are thus known as “riding hydrogen atoms” and they have been used for decades in small-molecule refinements (especially in cases where hydrogen atoms are not explicitly observed in the electron density maps). Since 2010 the program authors of PHENIX have encouraged users to incorporate riding hydrogen atoms into their refinement protocols (Adams P.D., et al. (2010) PHENIX – a comprehensive Python-based system for macromolecular structure solution. Acta Crystallographica D Biol Crystallogr 66:213–221; Afonine PV, Mustyakimov M, Grosse-Kunstleve RW, Moriarty NW, Langan P, Adams PD (2010) Joint X-ray and neutron refinement with phenix.refine. Acta Crystallogr D Biol Crystallogr 66:1153-63. ), and in fact, REFMAC adds the riding hydrogen atoms by default (http://www.ccp4.ac.uk/html/refmac5/keywords/restraints.html). The reasons for including riding hydrogen atoms in refinement are two-fold: 1) the hydrogen atoms actually exist in the molecules and contribute to the X-ray scattering at low resolution, so their inclusion in the refinement improves the agreement between Fobsand Fcalc at low resolution; and 2) their inclusion improves the geometry of the refined model, as they are used to analyze clashes due to van der Waals repulsions. Jane and David Richardson have shown the utility of this method with the MolProbity server, which requires hydrogen atoms for the all-atom contact analysis it performs for validation of macromolecular structures (Chen et al. (2010) MolProbity: all-atom structure validation for macromolecular crystallography. Acta Crystallographica D Biol Crystallogr 66:12-21.). The two major refinement packages handle riding hydrogen atoms differently. REFMAC utilizes implicit hydrogen atoms and does not automatically write them out to the resulting PDB file (although the user may choose to explicitly to write them out), and PHENIX automatically includes them in the resulting PDB file. The user would actively need to remove the hydrogen atoms from a file generated by the PHENIX refinement program prior to PDB deposition. The authors of this work have chosen to include all atoms used to calculate the structure factors that are deposited along with the model coordinates in the PDB, thus statistics for the riding hydrogen atoms appear in the PDB validation report. This dataset displays significant anisotropy, which results in the relatively low completeness in the highest resolution shell during data collection (79.4%). Anisotropic diffraction was corrected to adjust the error model and to compensate for a radiation-induced increase of non-isomorphism within the crystal. These corrections were applied to the data during scaling in the autocorrections routine of HKL3000 and thus are responsible for the difference in completeness between the data collection and refinement (Borek D, Dauter Z, Otwinowski Z. (2012) Identification of patterns in diffraction intensities affected by radiation exposure. J Synchrotron Radiat 20:37-48; Borek D, Cymborowski M, Machius M, Minor W, Otwinowski Z. (2010) Diffraction data analysis in the presence of radiation damage. Acta Crystallogr D Biol Crystallogr 66:426-36; Borek D, Ginell SL, Cymborowski M, Minor W, Otwinowski Z. (2007) The many faces of radiation-induced changes. J Synchrotron Radiat 14:24-33.). The resolution chosen as the refinement limit (2.10 Å) was chosen carefully and is consistent with current practices. e) The electron density map, the refinement statistics and the model stereochemical parameters degrade in quality when the highest resolution limit used for refinement is 2.15 Å. It is current practice to include data from resolution shells that in the past were ignored due to a high percentage of weak data and/or lower than 100% completeness due to anisotropy (Diederichs K. and Karplus P.A. (2012) Linking crystallographic model and data quality. Science 336:1030-1033; Weiss M.S. (2001) Global indicators of X-ray data quality. J Appl Cryst 34:130-135; Diederichs K. and Karplus P.A. (1997) Improved R-factors for diffraction data analysis in macromolecular crystallography. Nat Struct Mol Biol 4:269-274.). In this case, inclusion of the data in resolution shells to 2.10 Å actually improves the model and refinement statistics, which are excellent, and thus the authors have not changed the upper resolution limit for the structure with the bile salt. We thank the Orth Lab for valuable advice and helpful discussions. We gratefully acknowledge Dr. Chad Brautigam and Dr. Thomas Scheuermann for assistance with ITC data collection and Dr. Zhe Chen for assistance with X-ray data collection. The structure in this report is derived from work performed on beamline 19-ID at the Argonne National Laboratory, Structural Biology Center at the Advanced Photon Source, operated by UChicago Argonne, LLC, for the US Department of Energy, Office of Biological and Environmental Research under contract DE-AC02-06CH11357. This work was supported by NIH grant R01-AI087808, (KO) and R01-GM094575 (NVG), Welch Research Foundation Grants I-1561 (KO) and I-1505 (NVG).